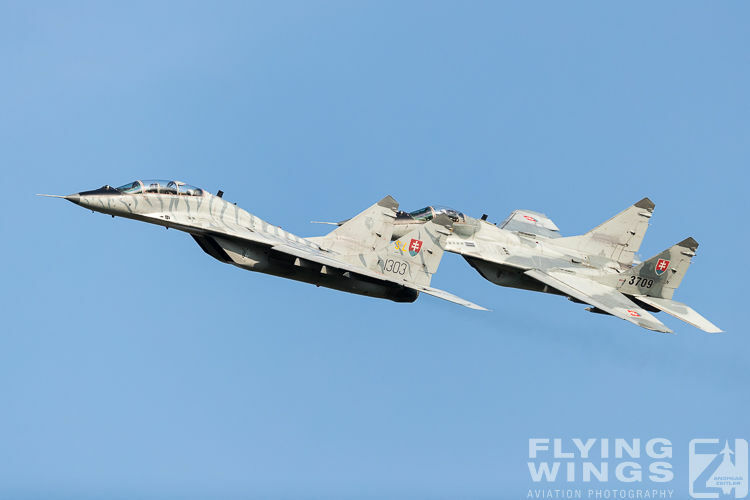 Travelling to countries operating the MiG-29 is usually a safe bet to see this great looking jet from the Soviet-era in the air. 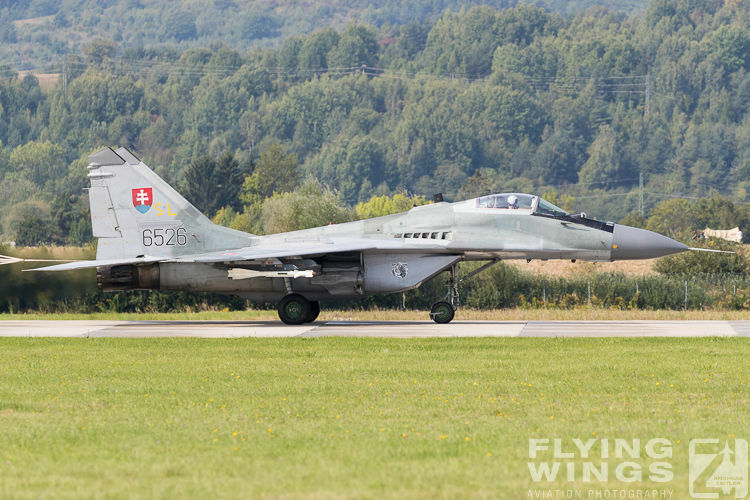 This was also true for the Slovak International Air Fest (SIAF) at Sliac, Slovakia. 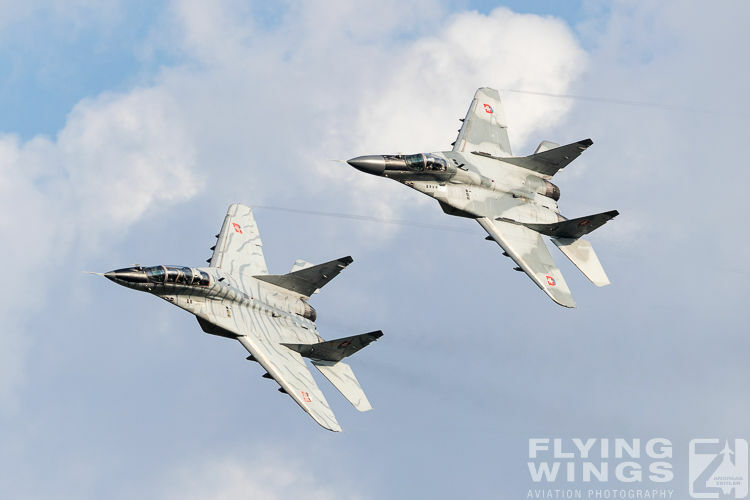 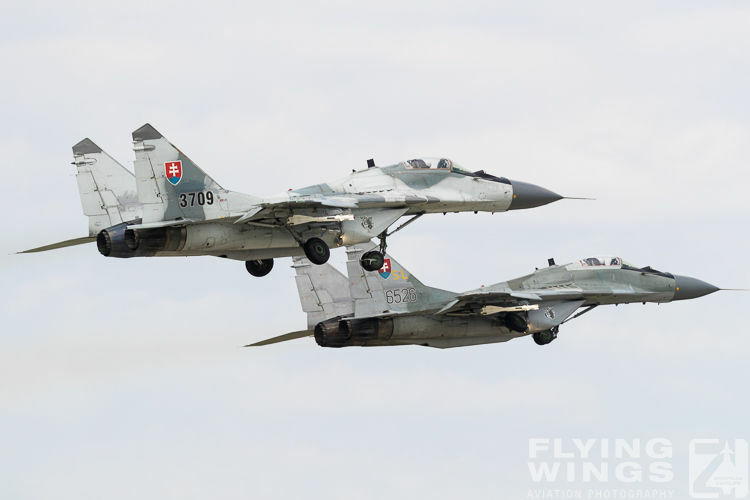 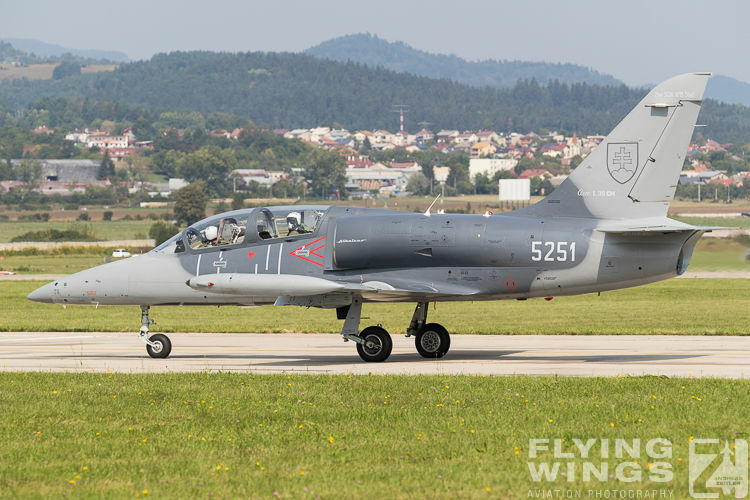 But the SIAF airshow was also a clear sign that the Slovak Air Force is in the state of transition to Western equipment. 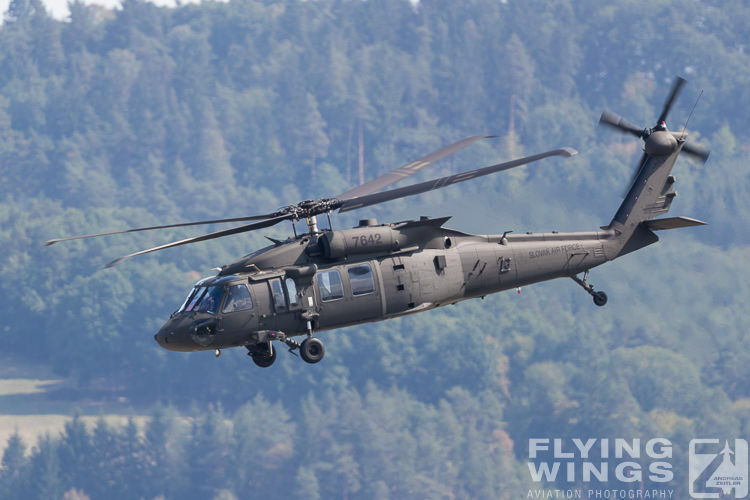 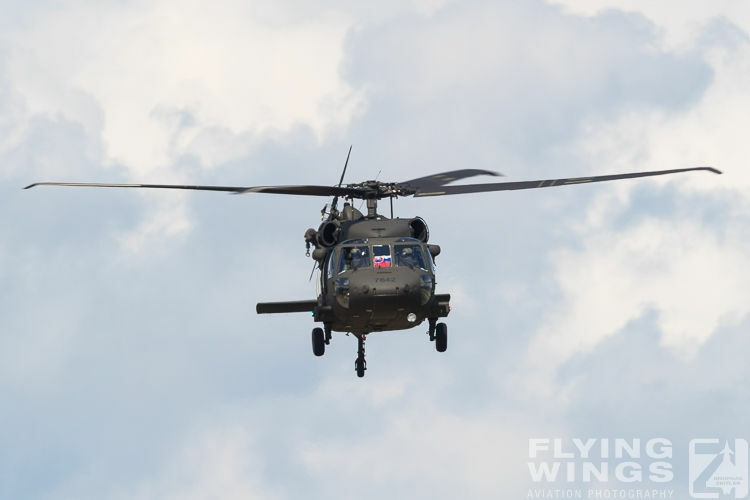 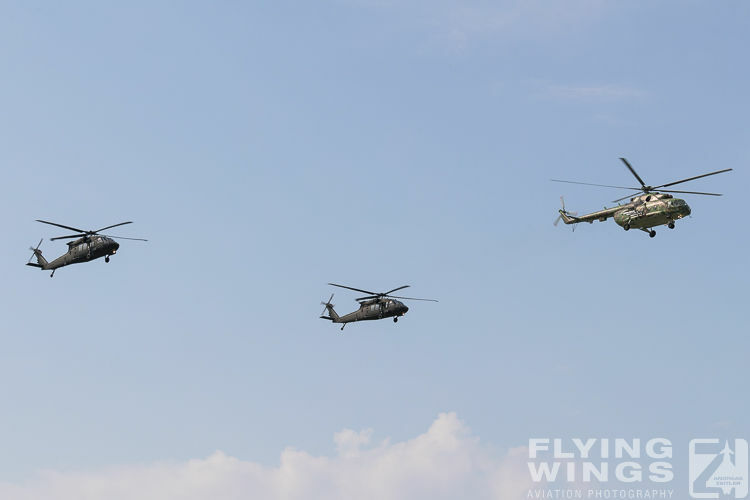 UH-60 Blackhawks were flying in formation with the venerable Mil Mi-17, and the Alenia C-27J Spartan has already completely replaced the trusted Antonov An-26 transport aircraft since 2016. 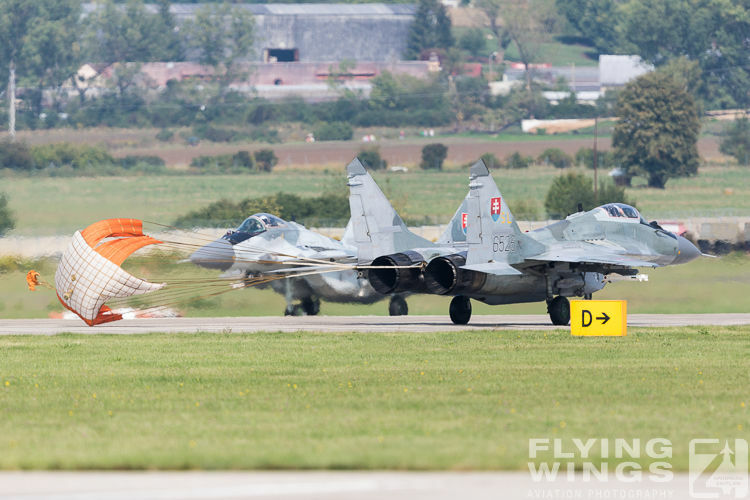 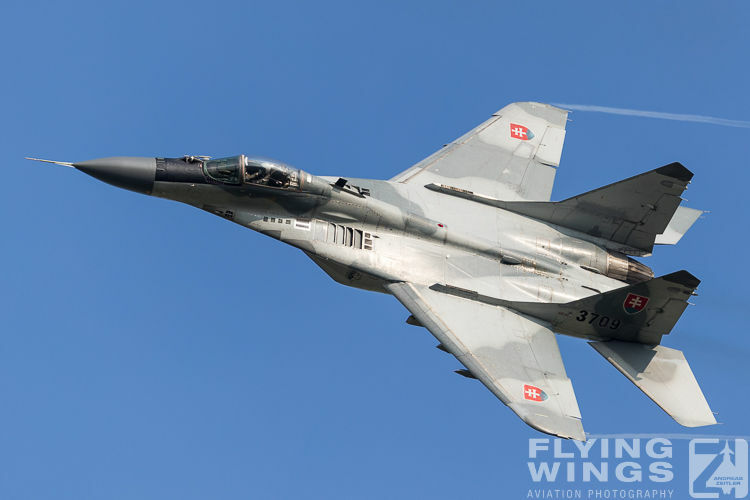 Also the days of Slovak MiG-29s are being counted, but SIAF 2018 was an event with another fine demonstration of the smoking Fulcrum! 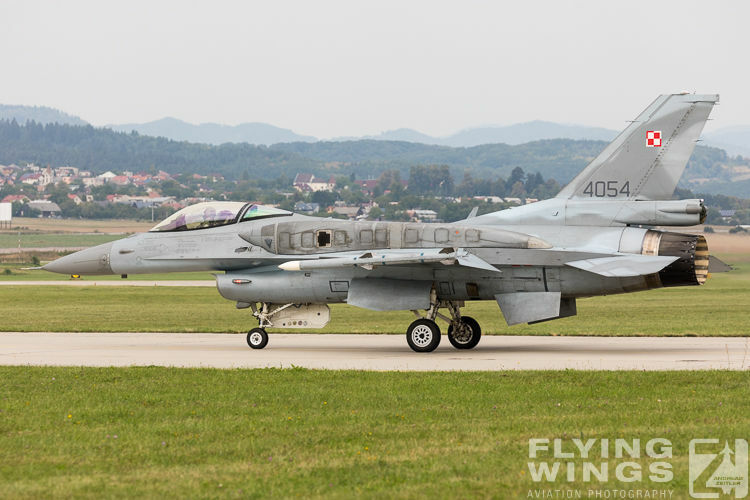 Shortly before SIAF 2018 the formal announcement has been made: Slovakia is about to purchase 14 Lockheed Martin F-16C Block 70/72 "Fighting Falcon" aircraft. 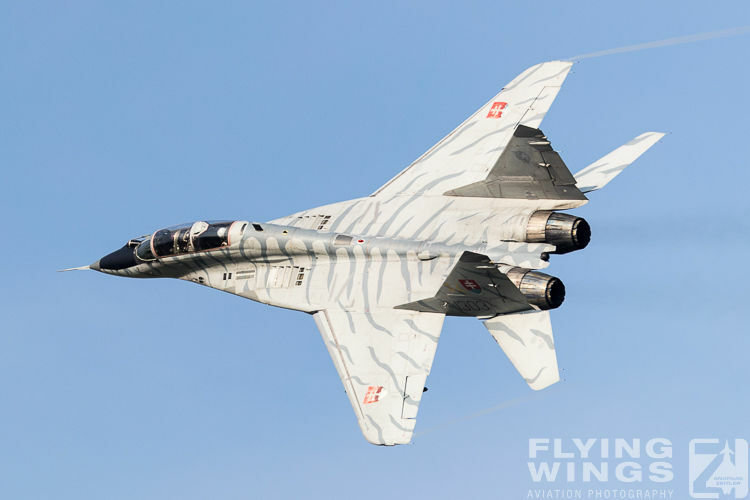 Delivery is scheduled to start in 2022, when the American jets will begin to replace the 12 aged MiG-29s that are still operational of the 1st Tactical “Tiger” Squadron at Sliac. 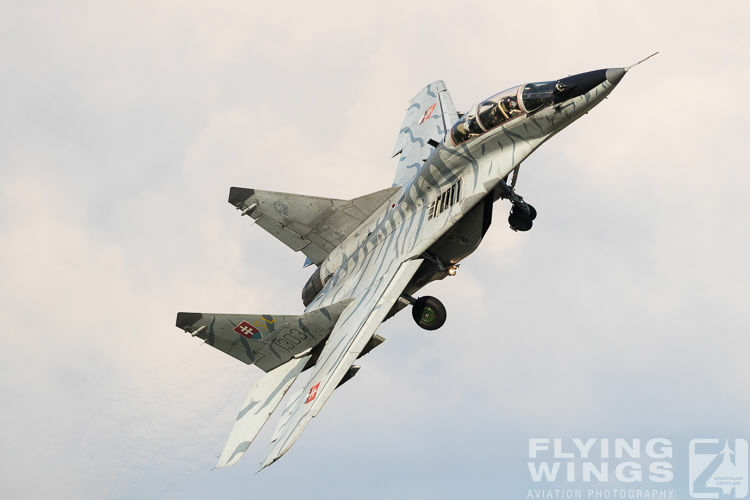 Luckily the next SIAF airshows will thus still feature the MiG-29, which is still a crowd’s favorite in the air! 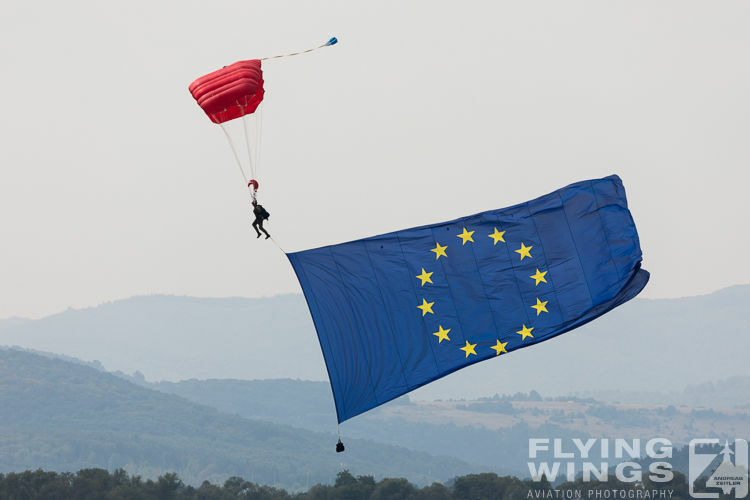 But obviously their numbers are going to dwindle down. 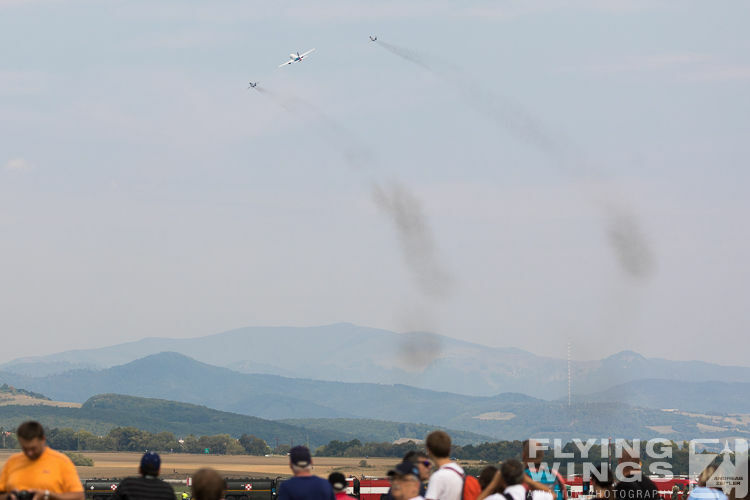 Unfortunately the Solo Display of the Slovakian MiG-29 Fulcrum did not take place this year due to health reasons of the display pilot, but the aerobatic routine of a two-ship formation of Fulcrums was a more than welcome replacement. 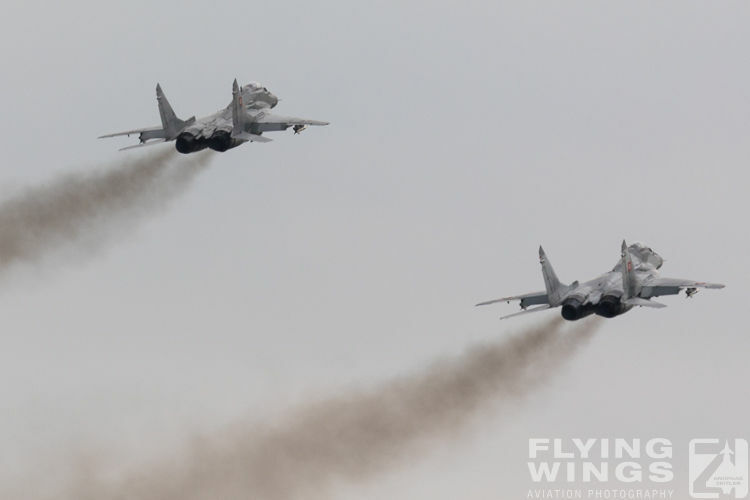 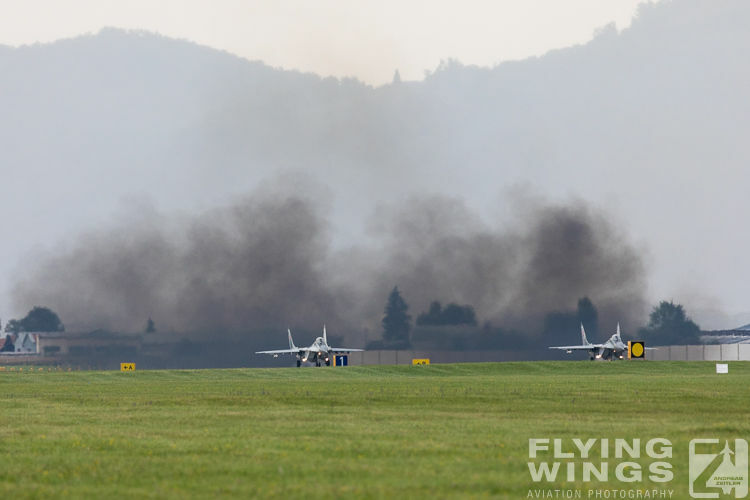 The former display pilots "Buker" and "Mat" showed of the two MiG-29s in close formation and with the distinctive black smoke trails in front the Tatra mountains. 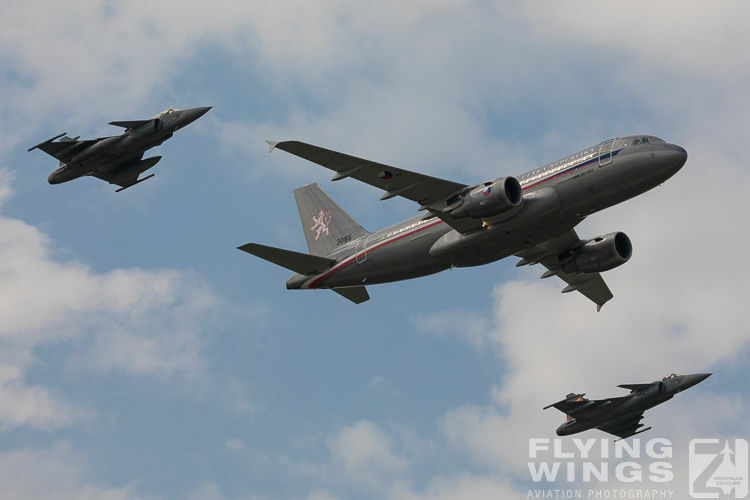 To celebrate the centenary of the Czechoslovak Air Force within the SIAF 2018 two Czech Air Force JAS 39 Gripen and the Airbus A319 of the Czech Air Force were also part of this fly-by. 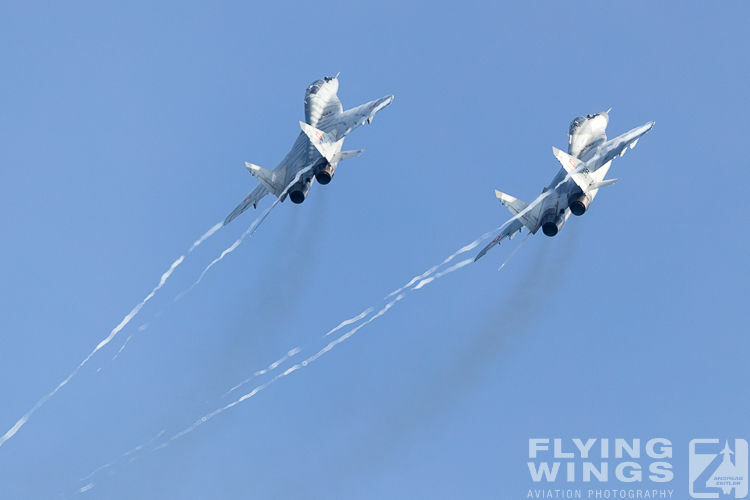 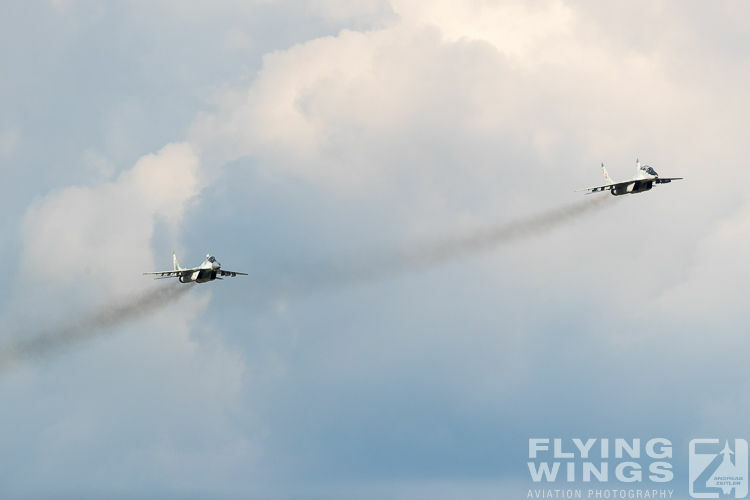 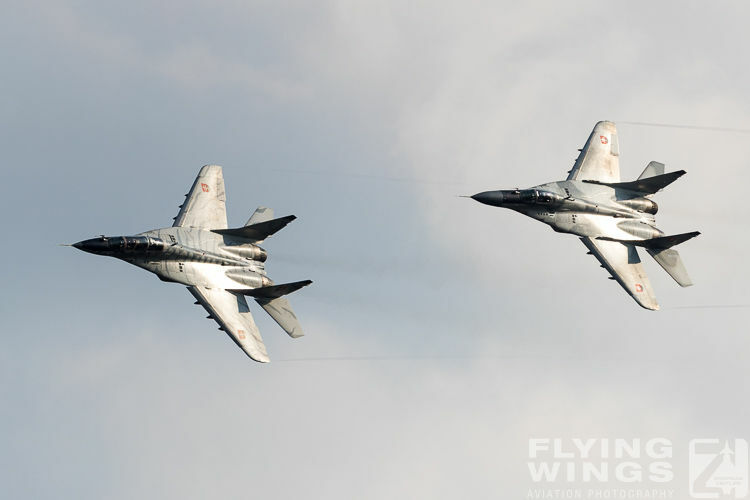 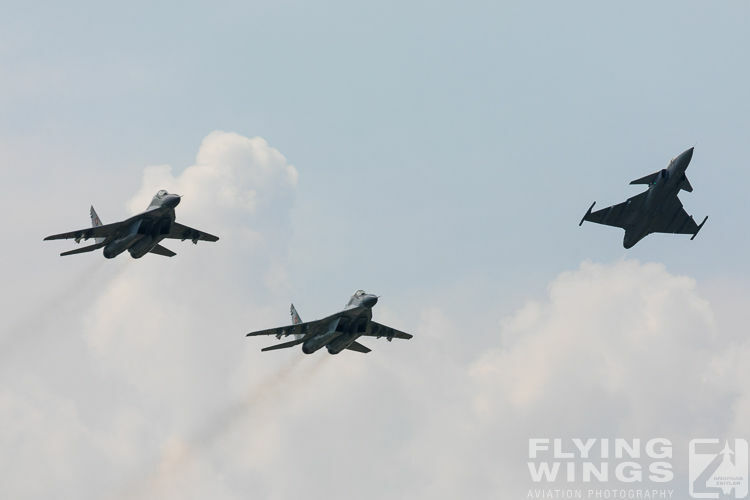 The fourth part was finally the Slovak A319 in formation with two MiGs. 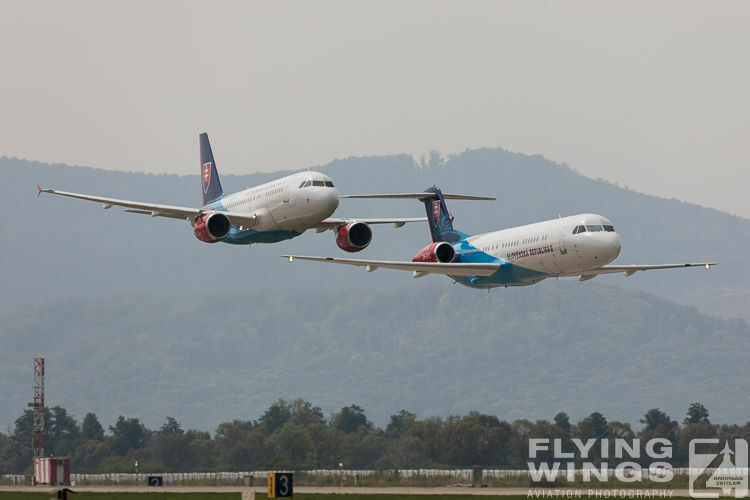 After the quick succession of these four formations the Slovak A319 returned in formation with Slovakia’s second state transport aircraft, a Fokker 100, for some nice fly-bys and touch and goes. 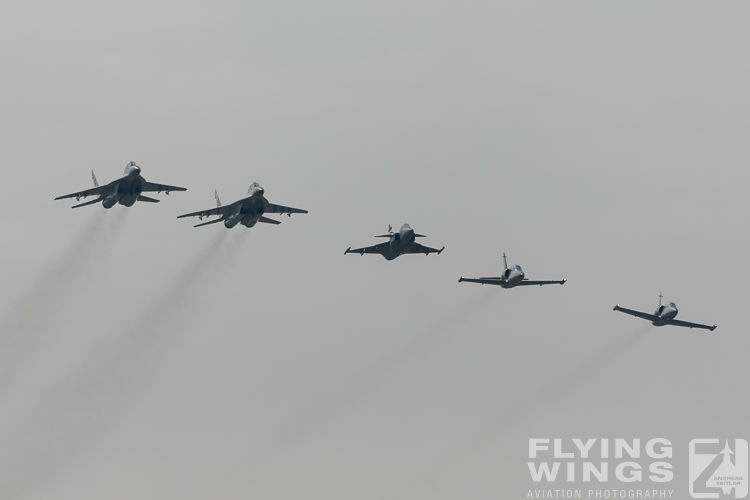 It was particularly impressive to see how low these jets were flown over the runway. 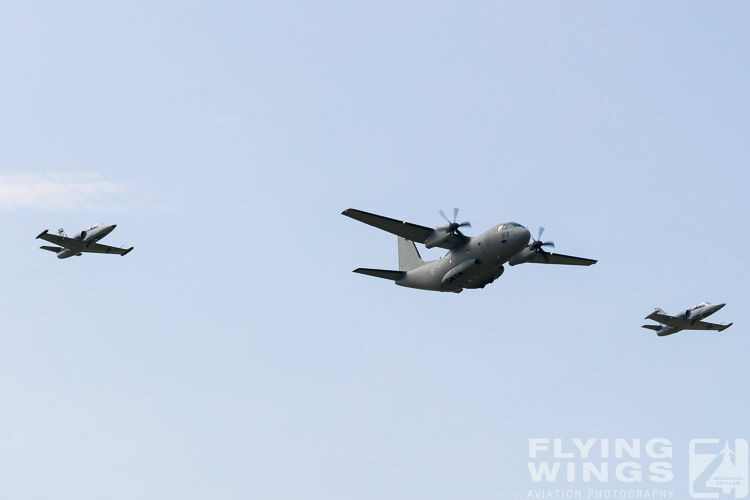 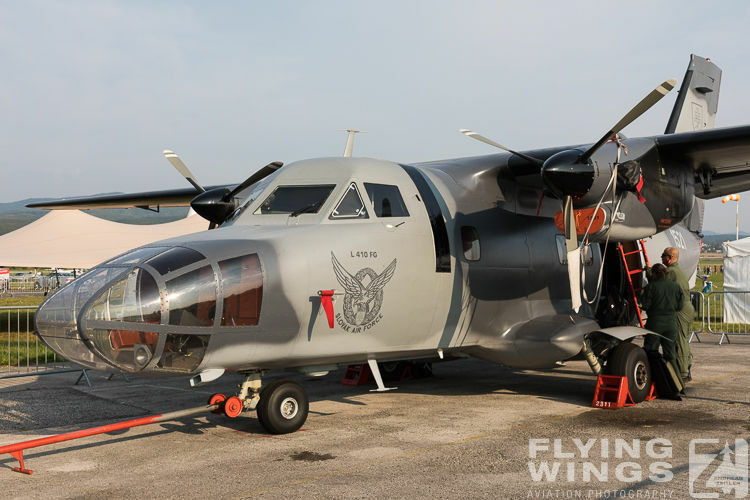 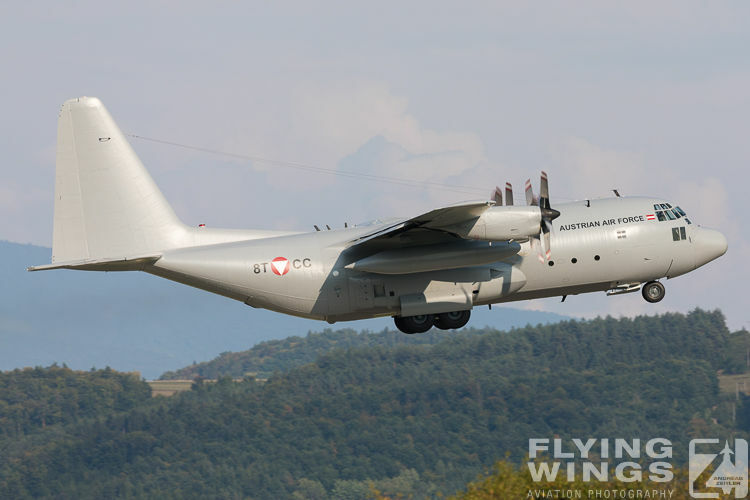 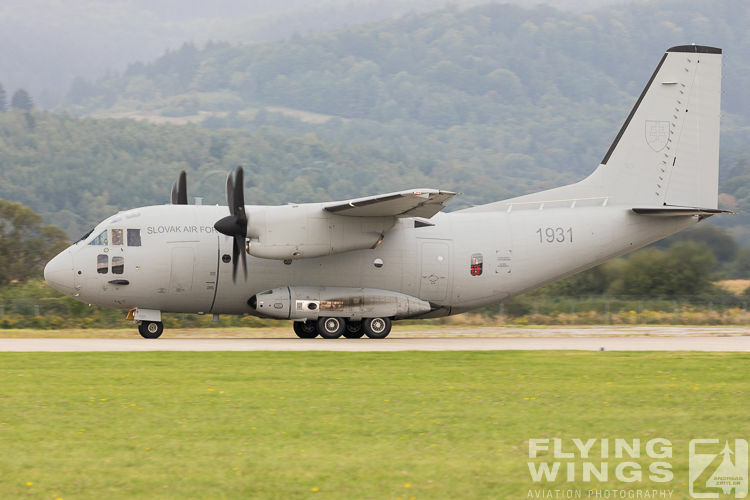 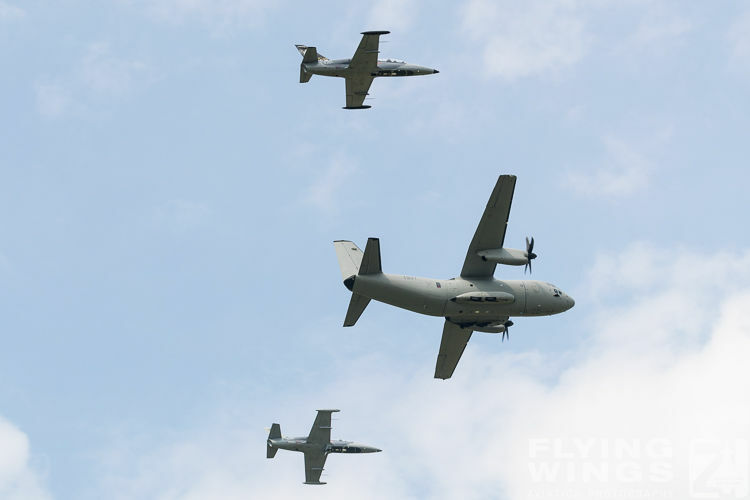 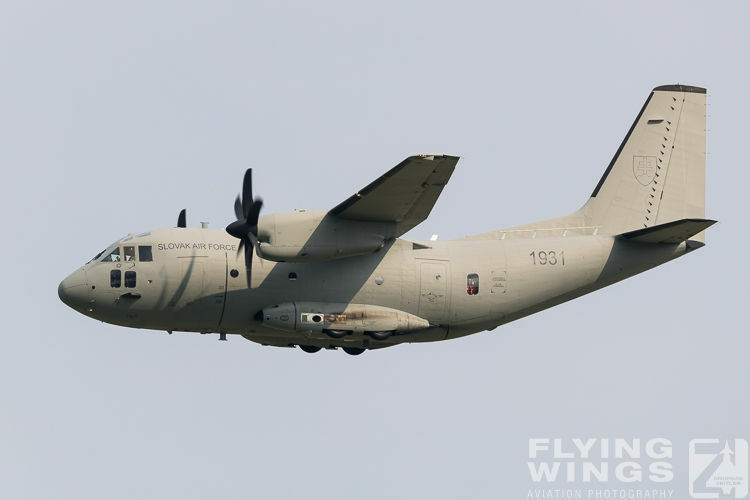 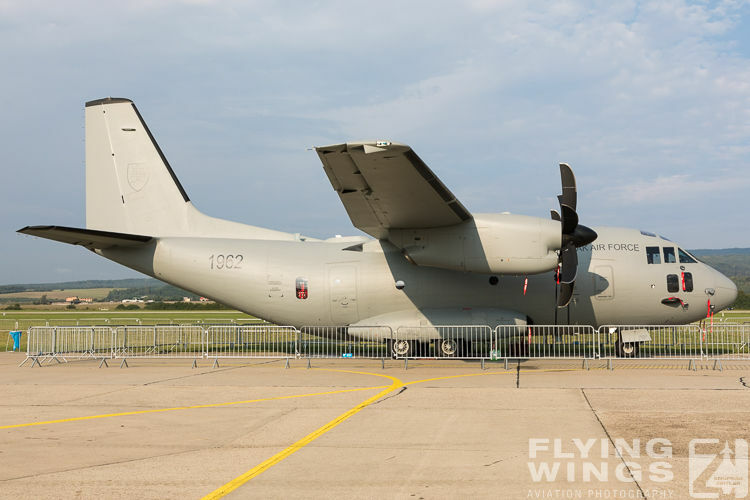 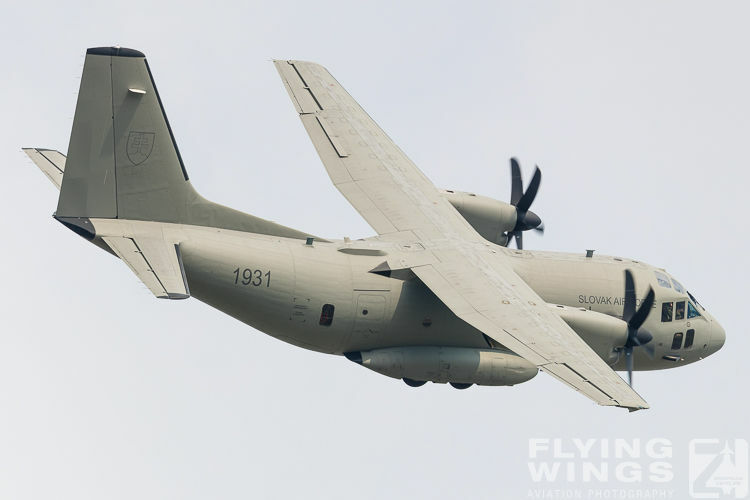 Also the recently acquired C-27J Spartan was presented during a flying display later in the afternoon. 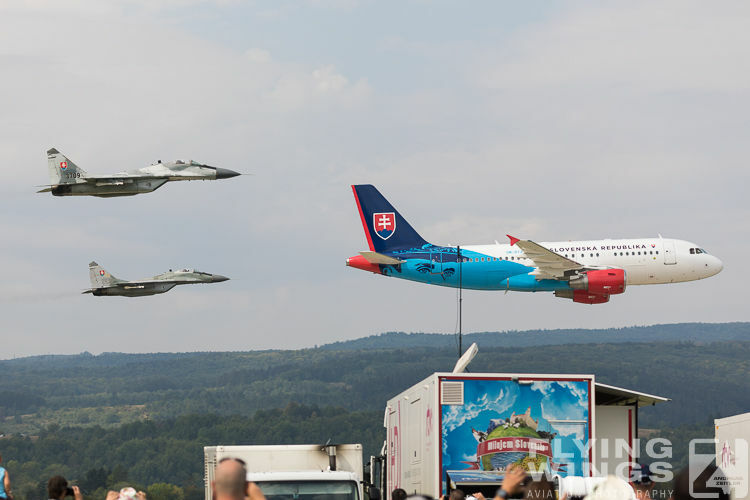 But of course the SIAF airshow is not only “Slovak”, it is also “International”! 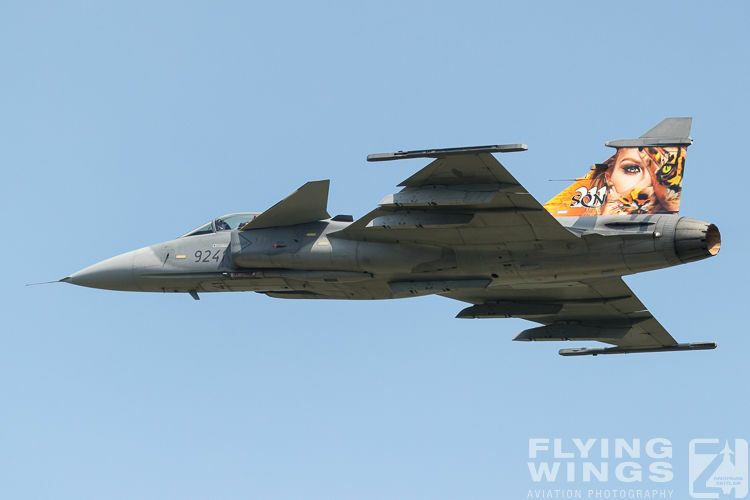 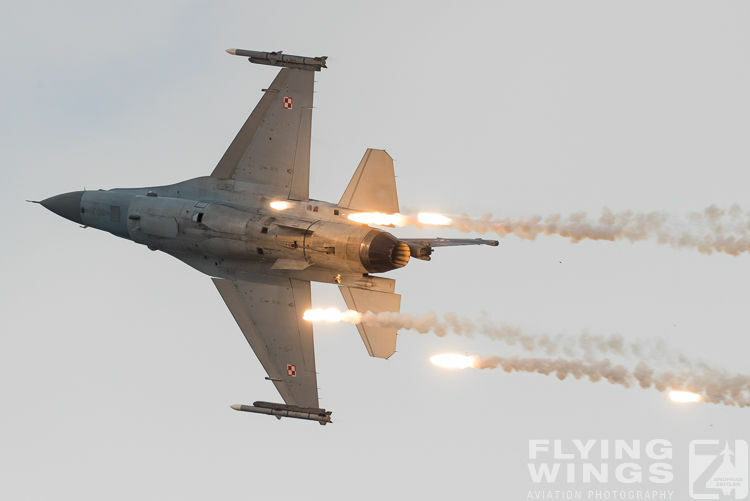 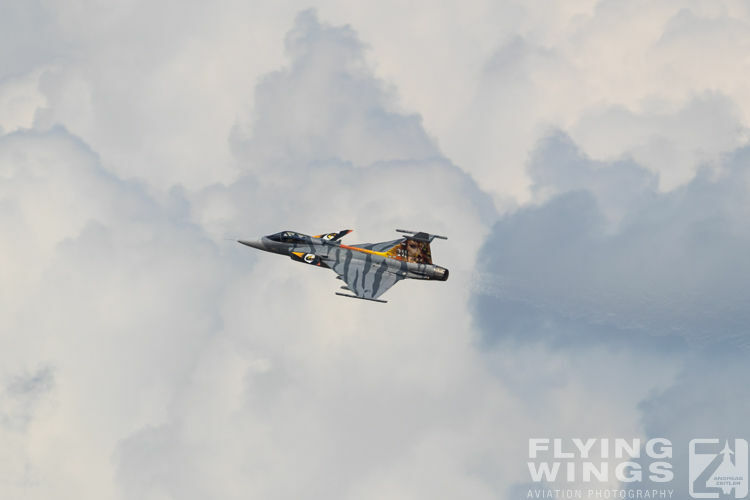 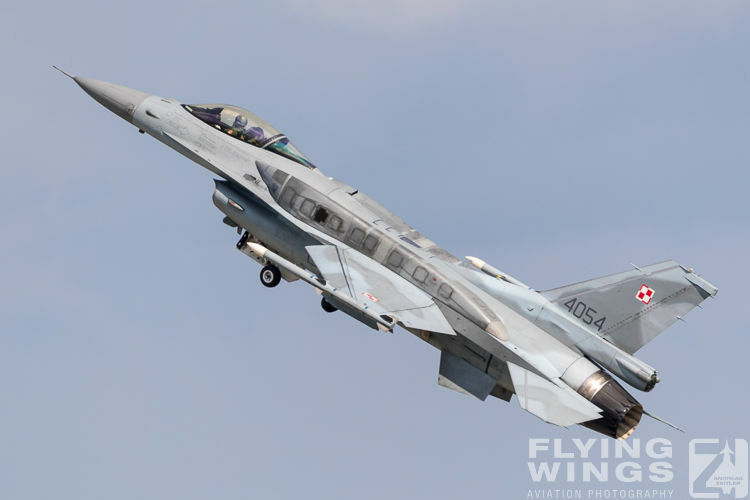 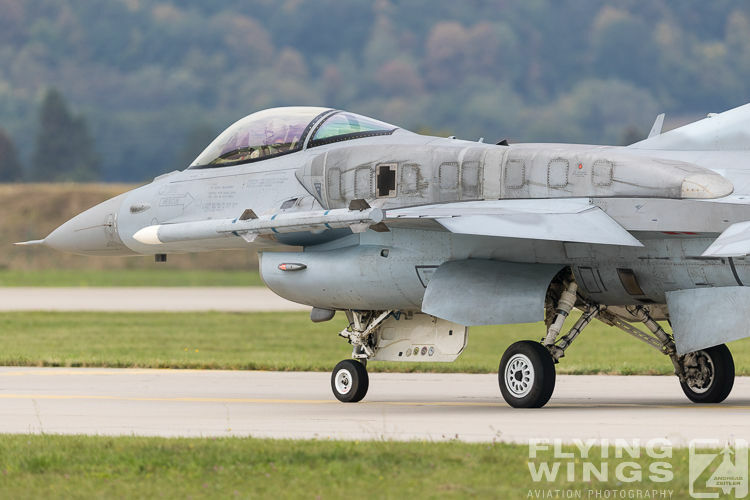 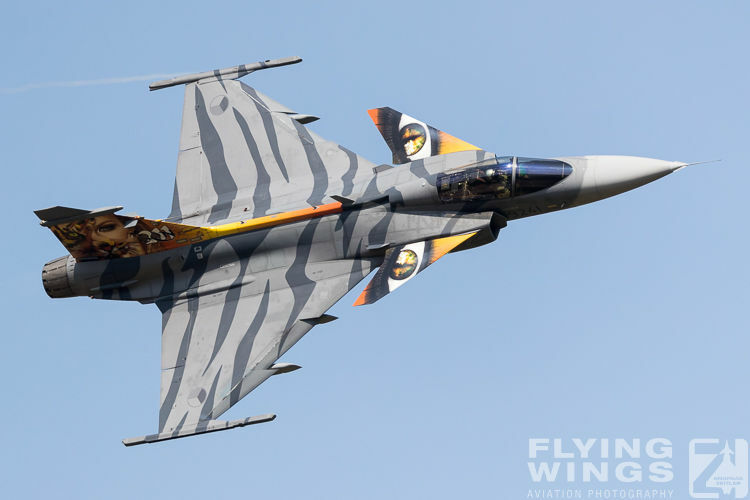 A taste of Slovakia’s future jet fighter was given this year by the Polish Air Force F-16 “Tiger” demo team. 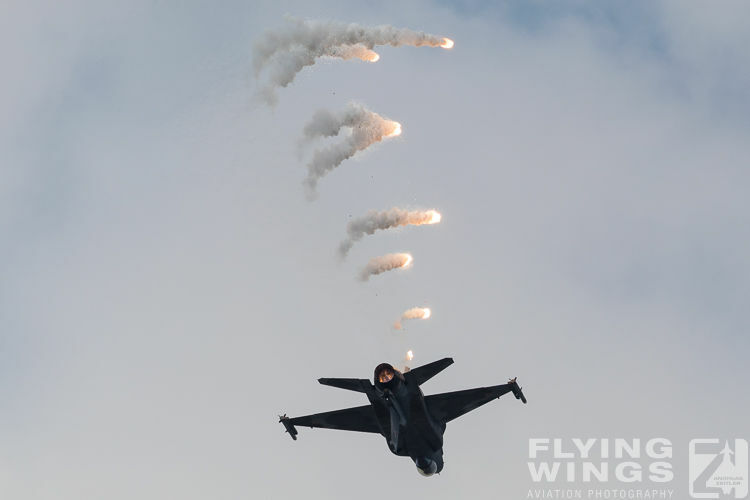 This display was flown with a jet equipped with conformal fuel tanks (CFT) and AMRAAM inert missiles on the wing tips. 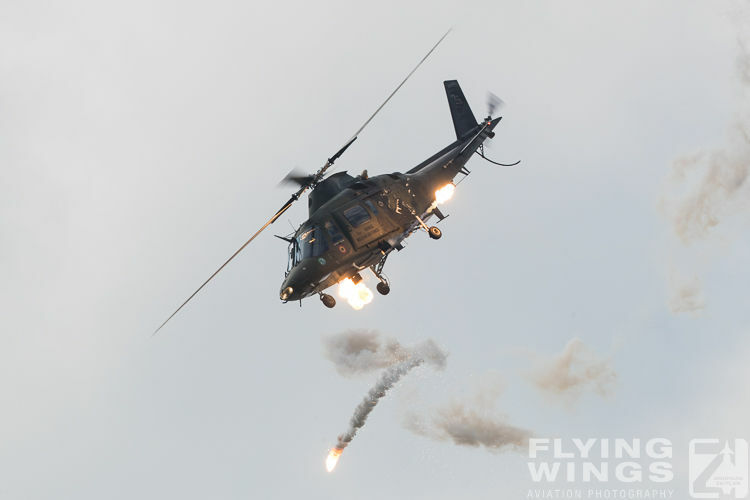 This ‘combat ready’ appearance was then greatly boosted by a good use of flares during the routine. 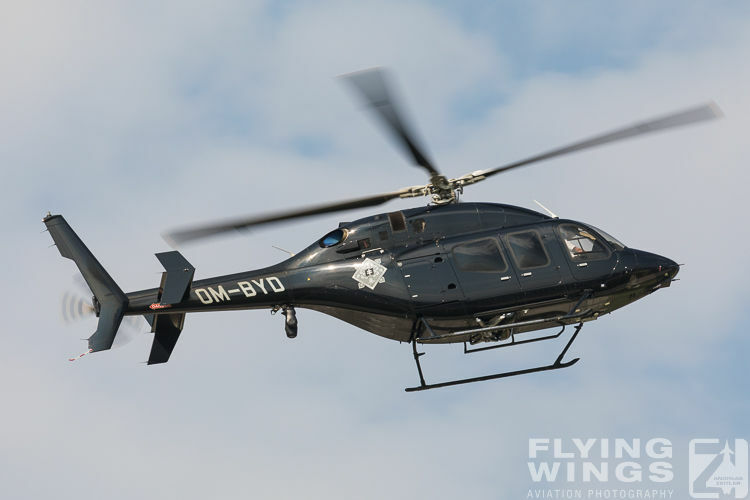 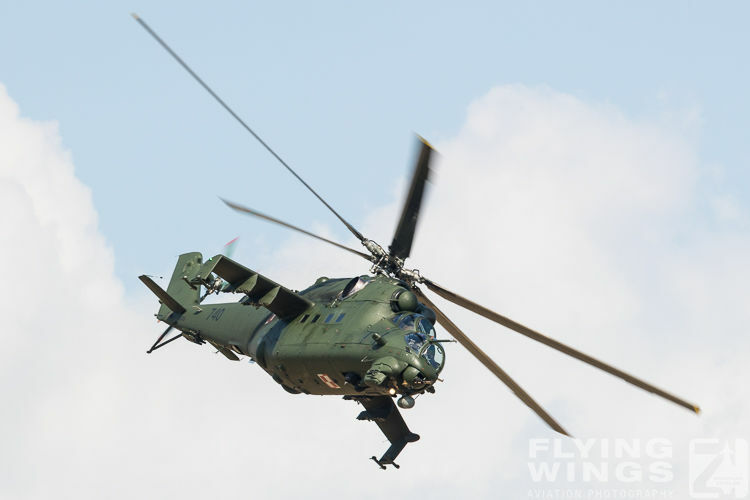 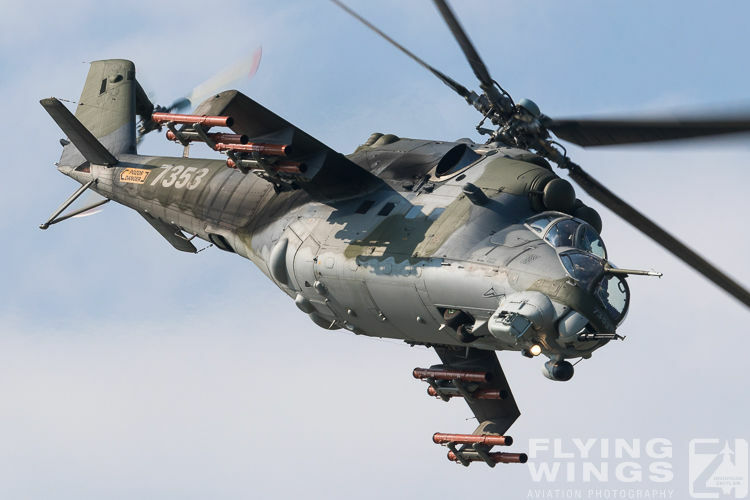 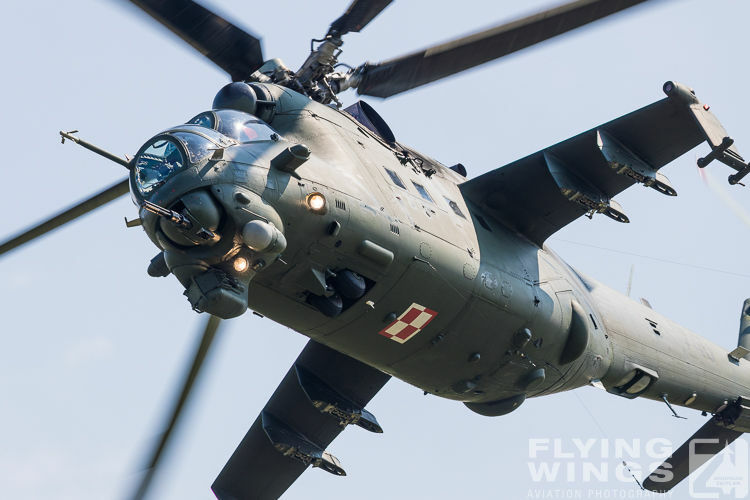 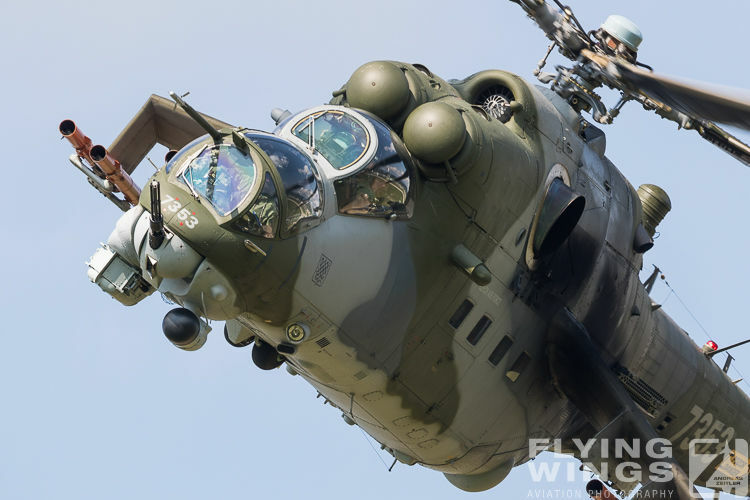 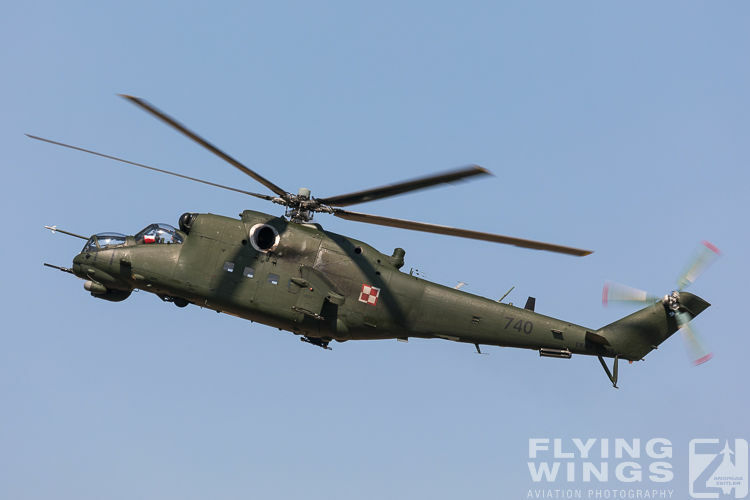 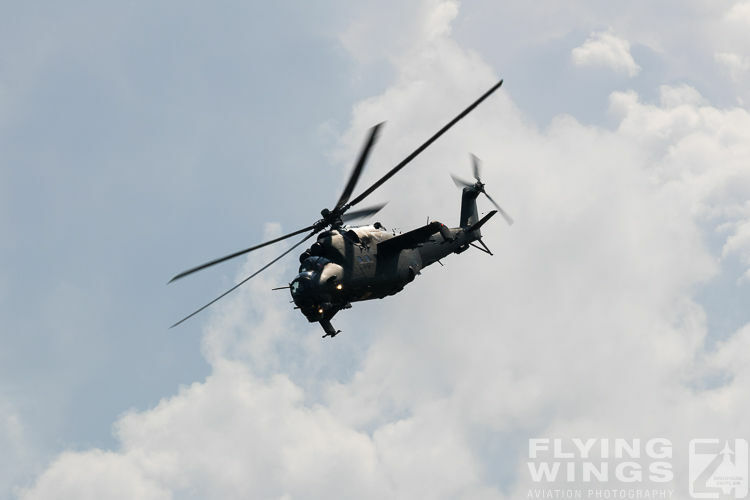 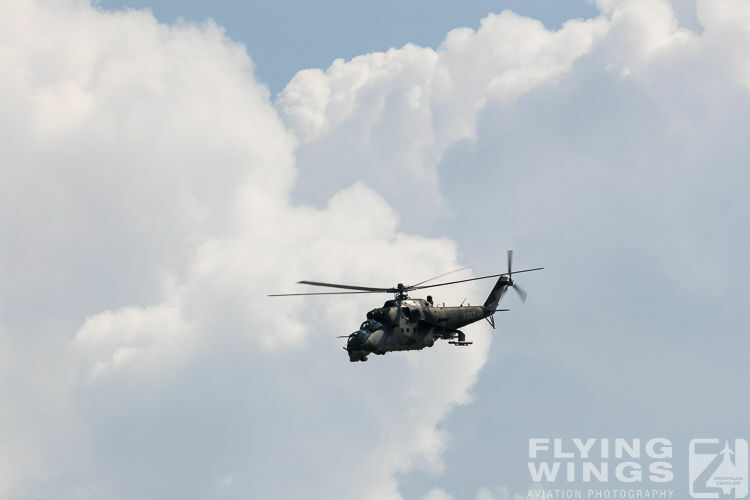 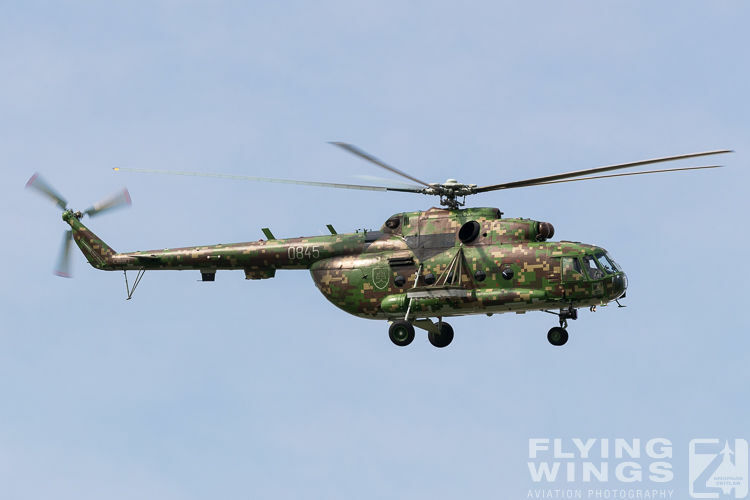 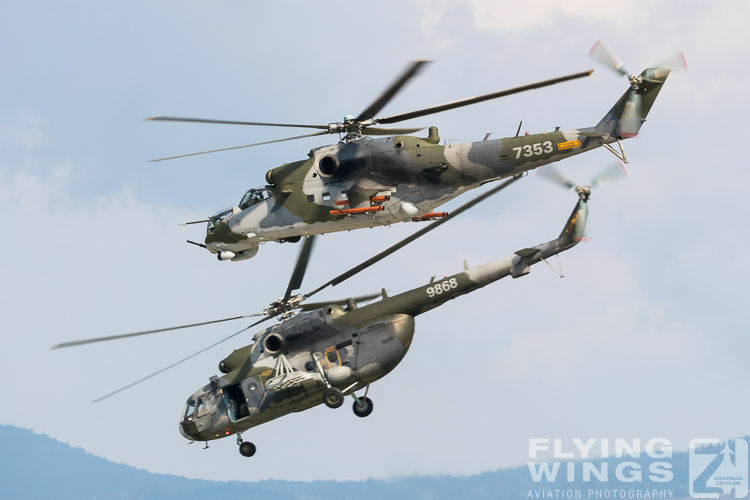 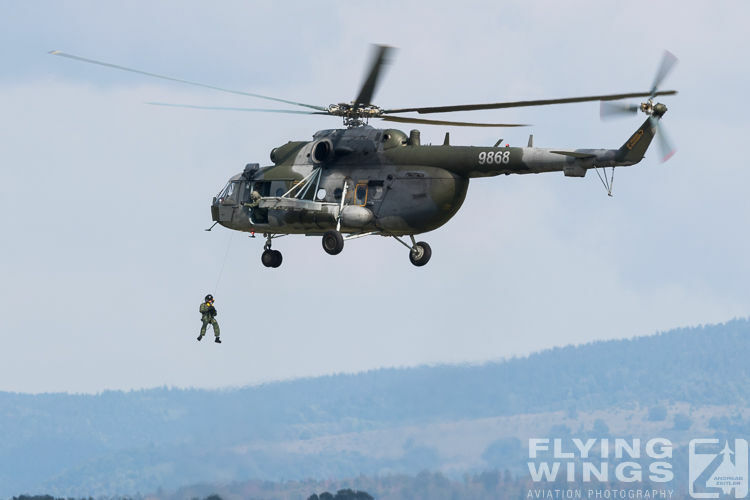 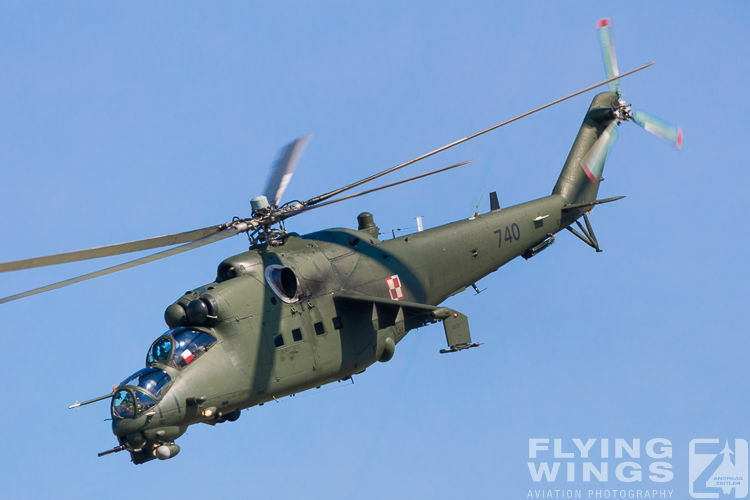 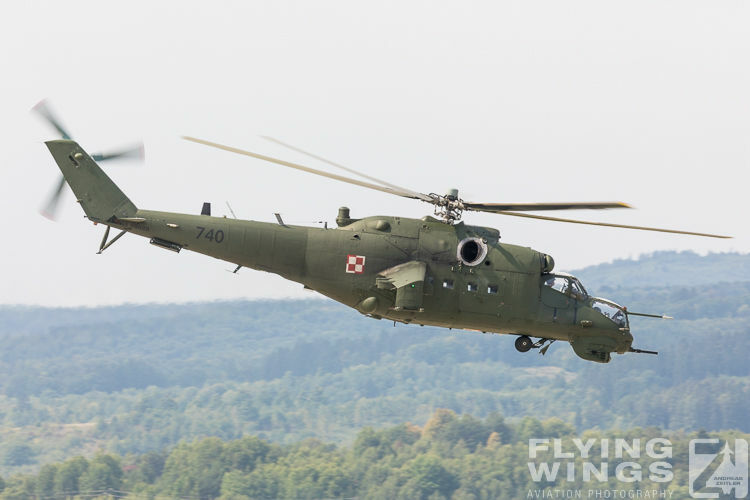 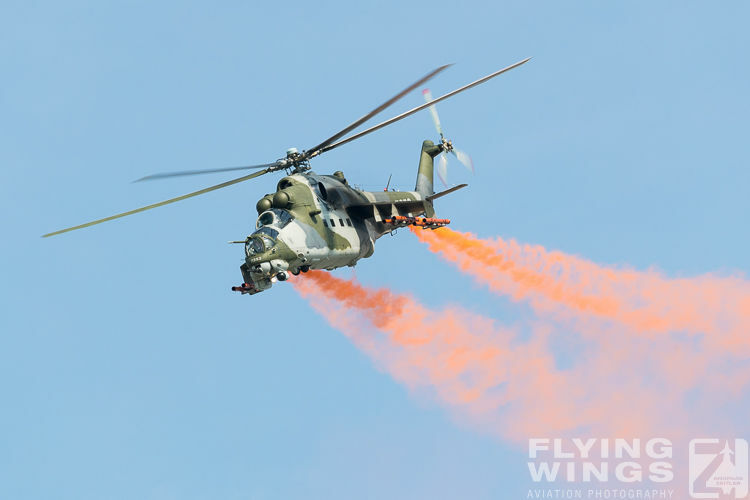 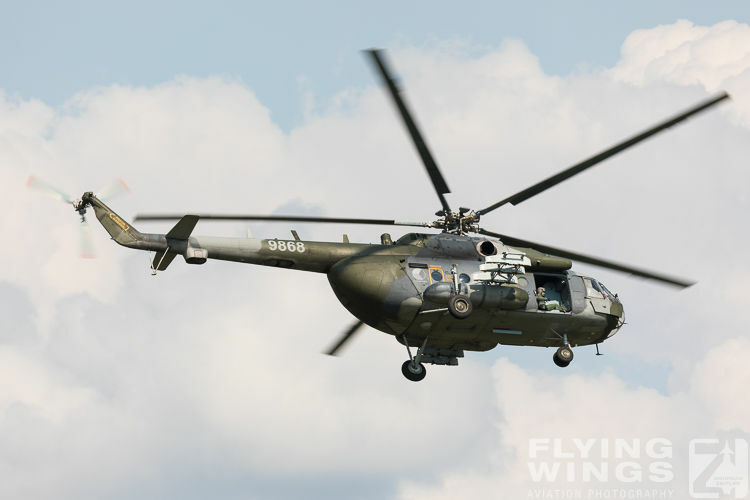 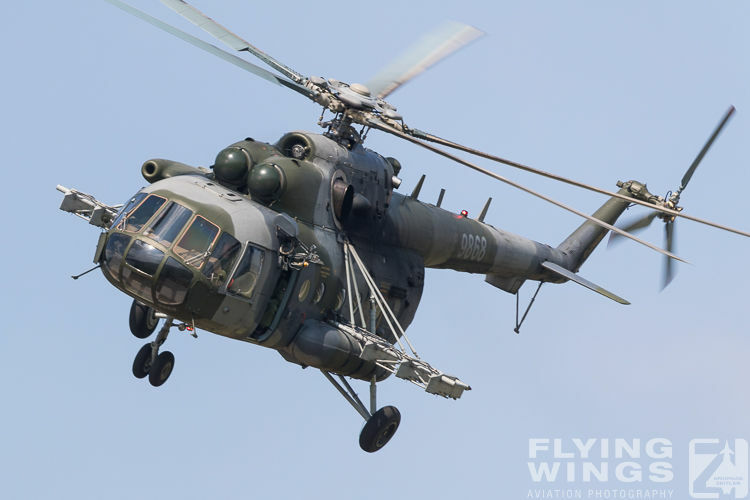 Amongst the helicopters the Belgian Air Force presented its Agusta A109 in flight, and SIAF 2018 also saw the rare appearance of a Polish Army Mi-24 combat helicopter in the flying display. 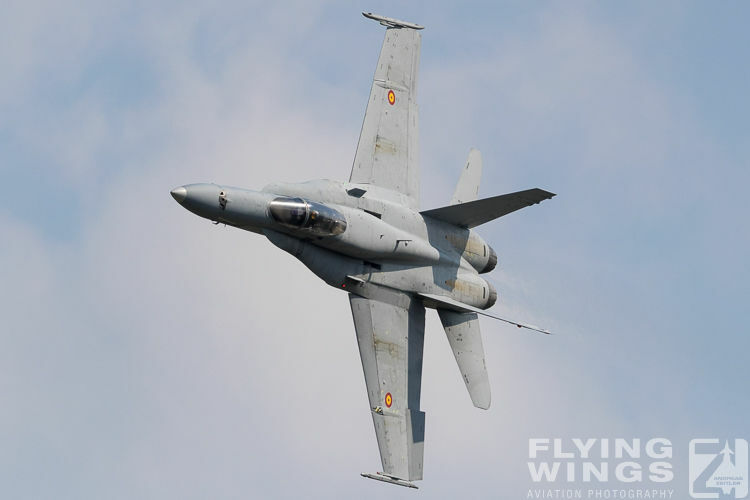 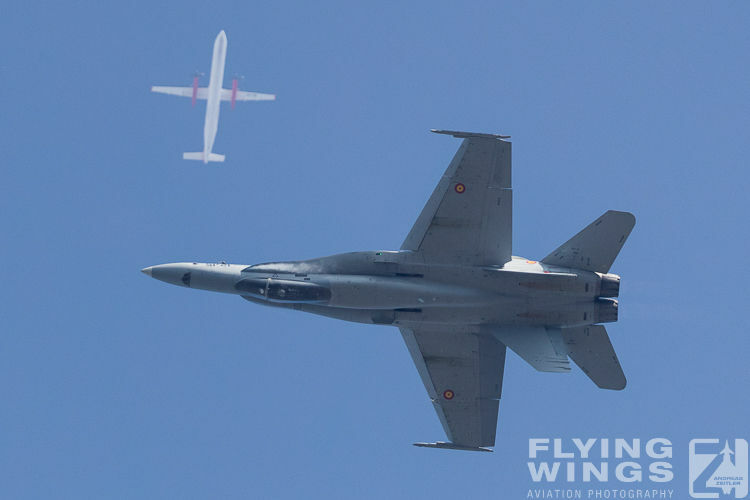 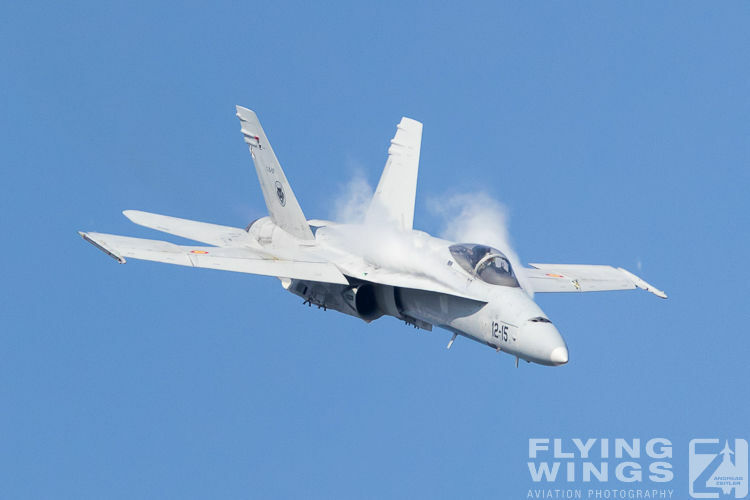 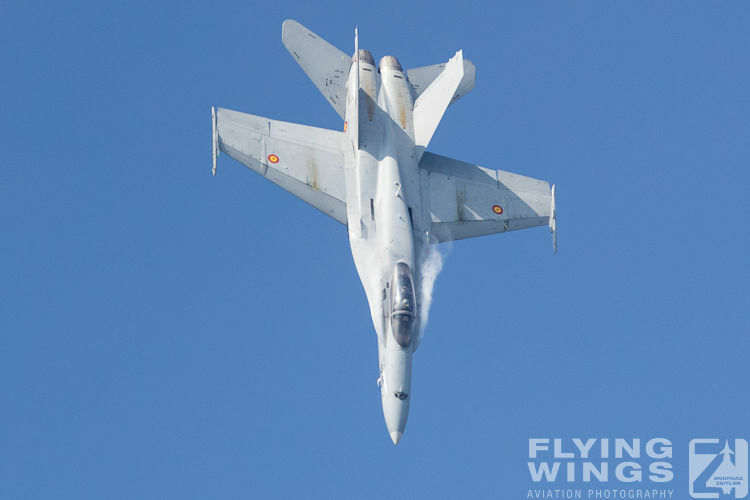 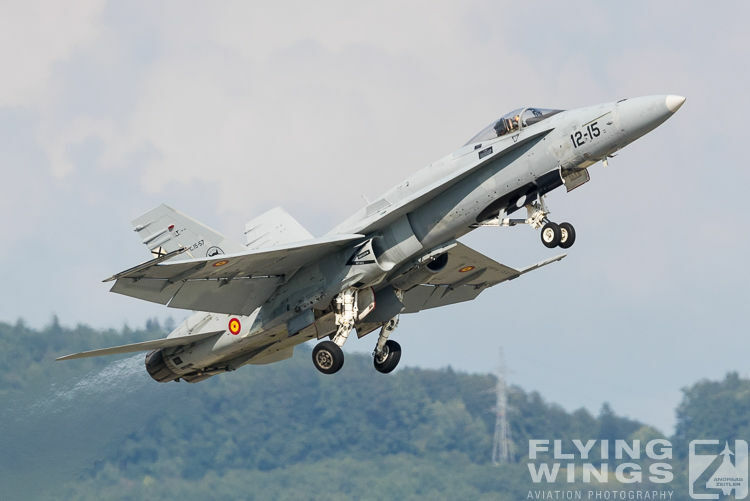 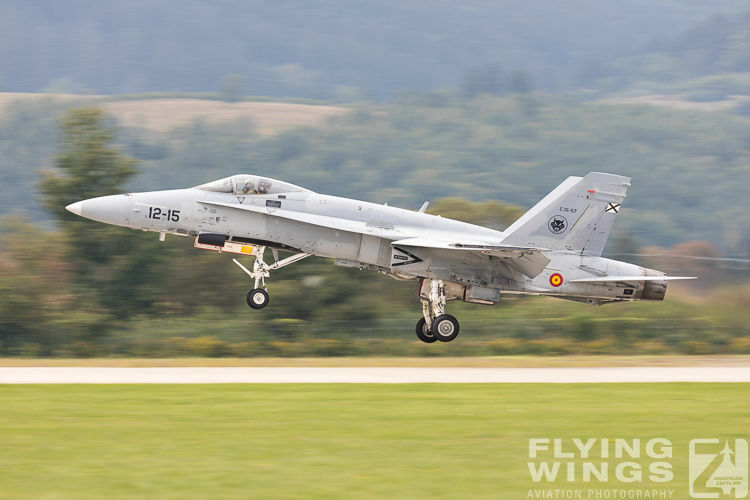 In your author’s opinion this fine piece of flying was just excelled by the Spanish F/A-18 / EF-18MHornet demo. 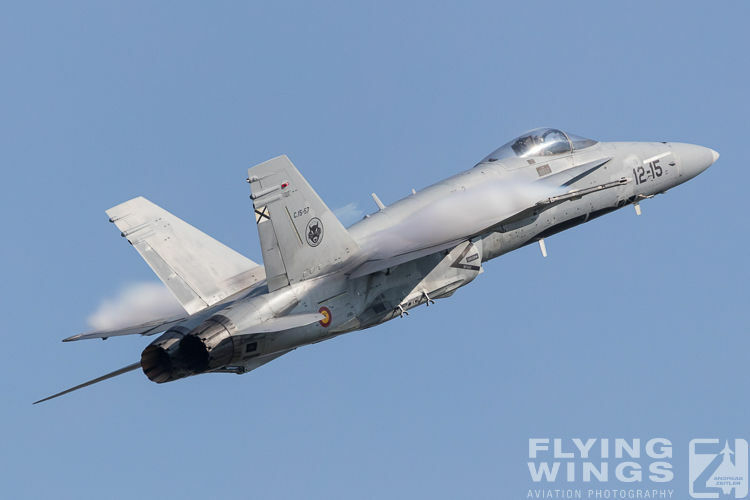 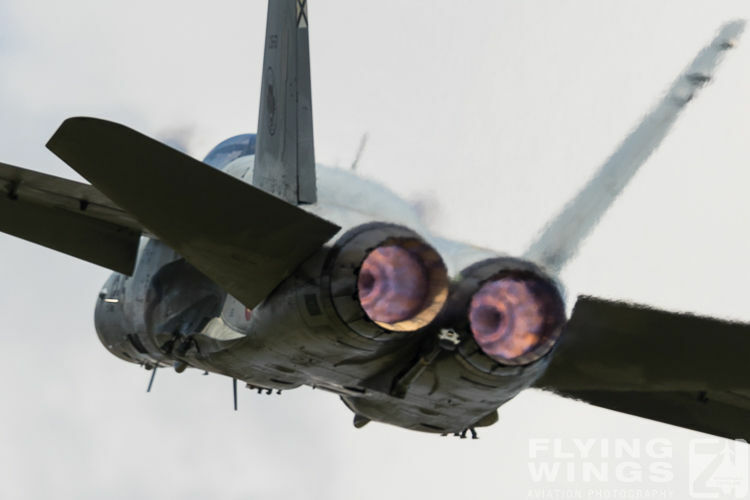 To see how the display pilot presented the Hornet at low speed and during high angle of attack (AOA) maneuvers was just outstanding! 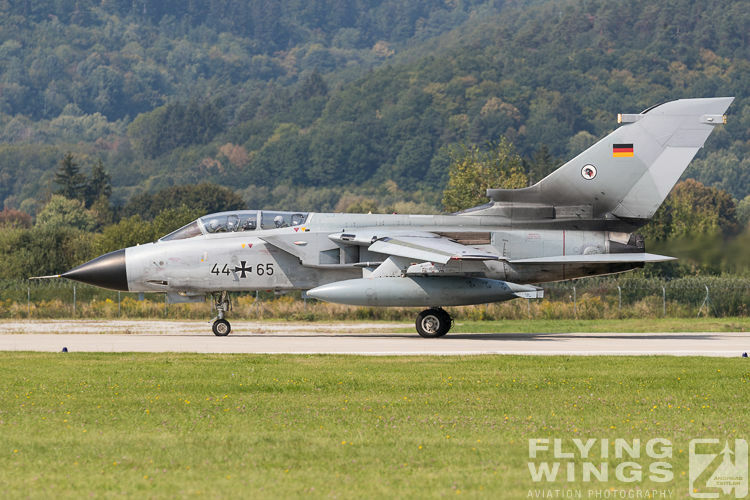 Another fine view was also the German Luftwaffe’s Tornado of TaktLwG51s. 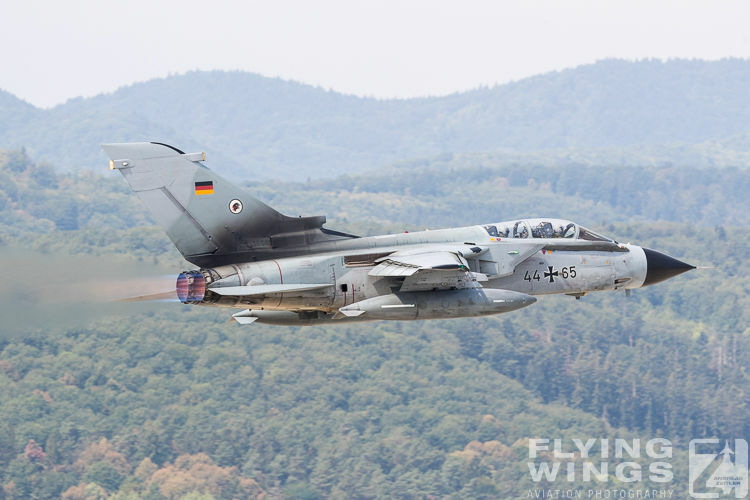 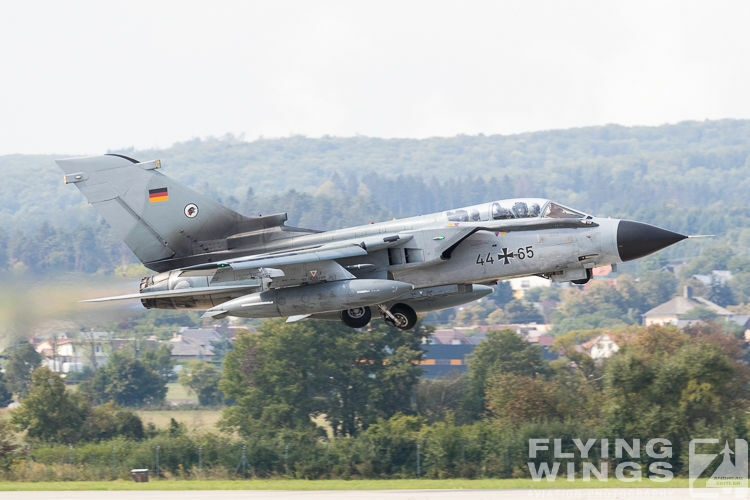 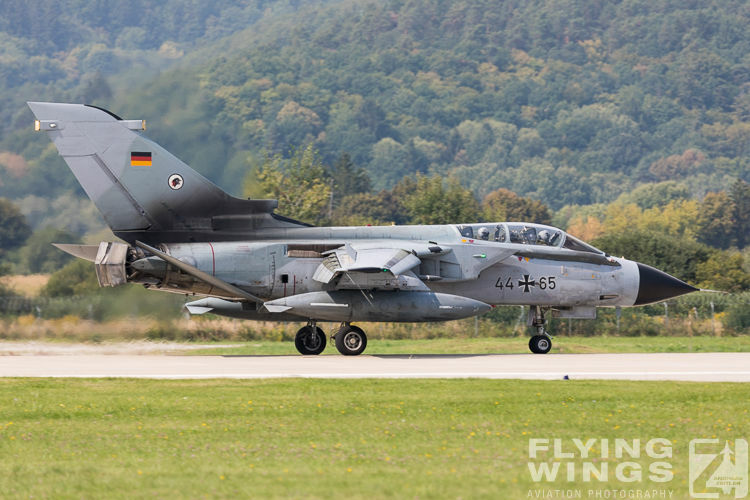 Its display was much more conservative and consisted only of a high speed pass and a go-around, however considering the fact that there is no official Tornado display team, this rare in-flight appearance of a German Tornado must be highly appreciated. 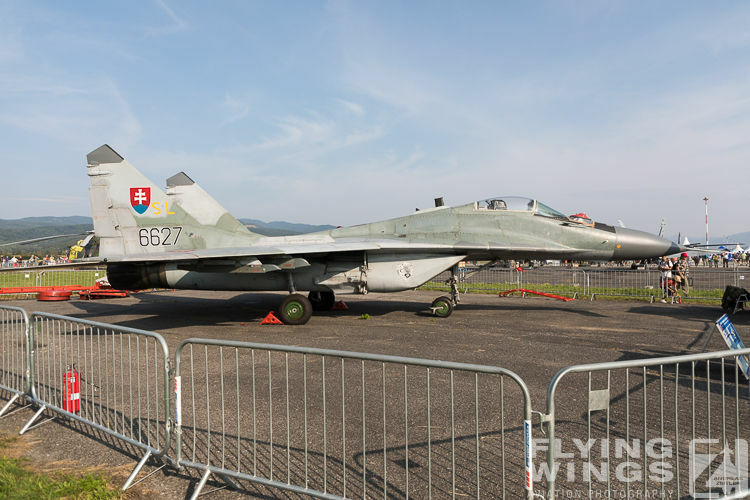 A big player at SIAF was also the Czech Air Force. 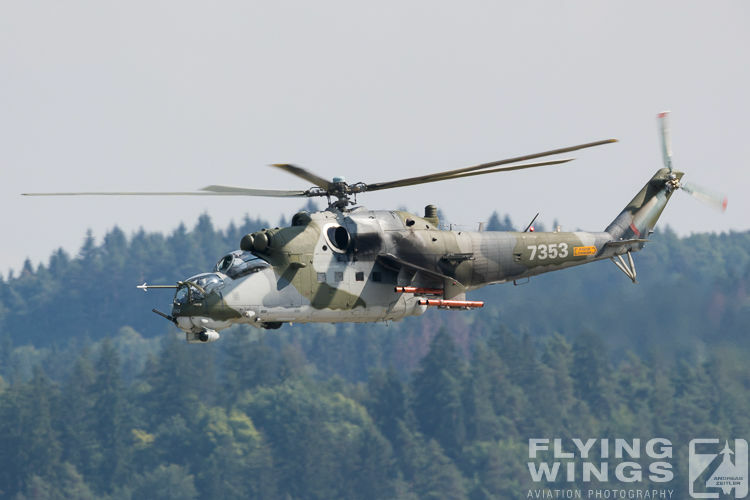 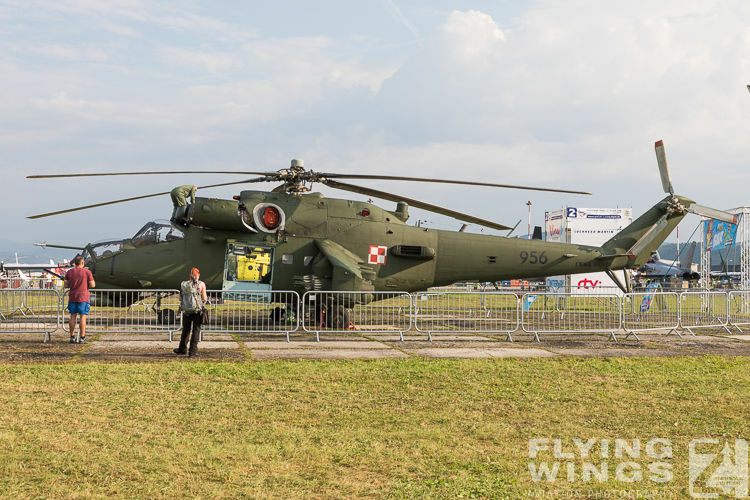 With the CIAF at Hradec Kralove, Czech Republic, being held at the same week-end, it was amazing to see that the Czech Air Force did send its Gripen Solo Display, the Mil Mi-35 Solo Display as well as the Mi-35 & Mi-171 CSAR demo to Slovakia and not to the airshow in its home country. 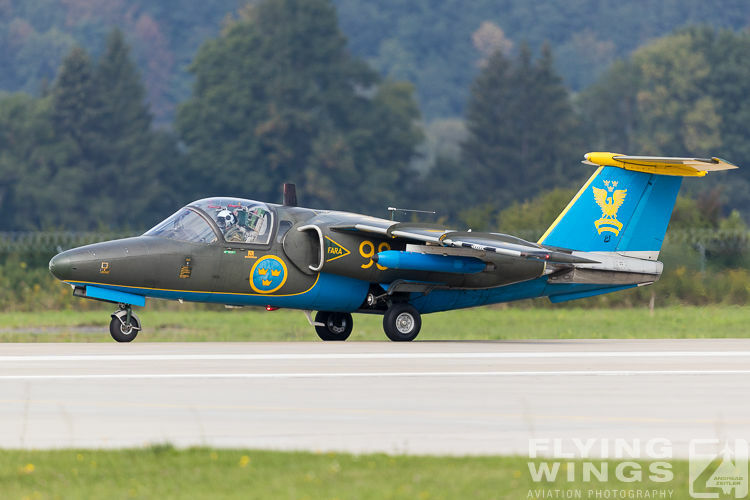 Not so noisy was the Swedish Saab Sk60 routine, but it is a nice plane in nice colours and the aerobatic flying was gentle and very well performed by Capt. 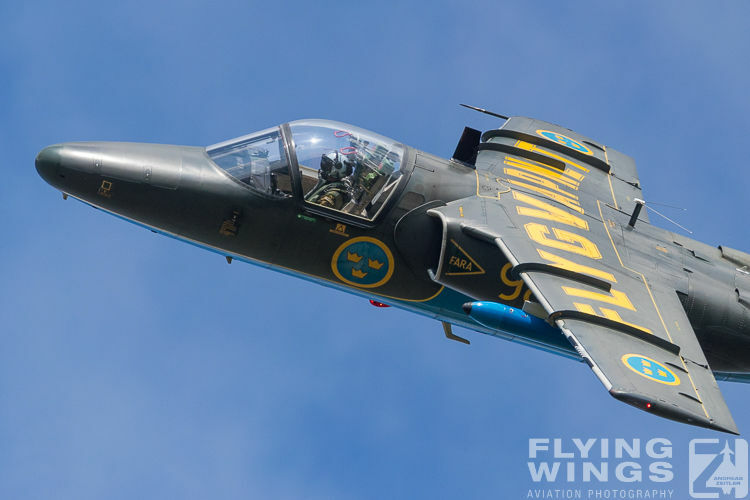 Peter Hedberg. 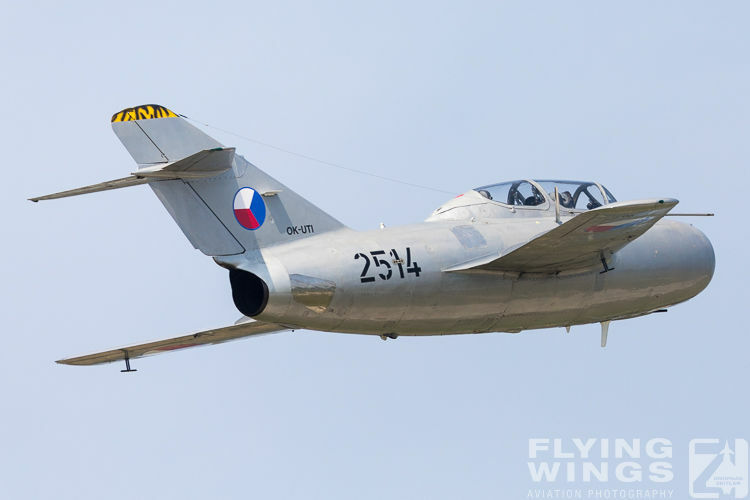 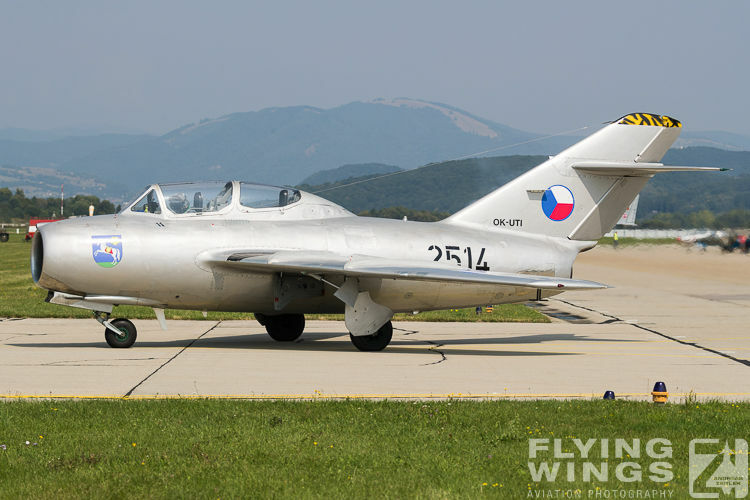 In the same category of aircraft, but from the other side of the iron curtain, belong the MiG-15UTI from the Czech Republic and the Slovak L-29. 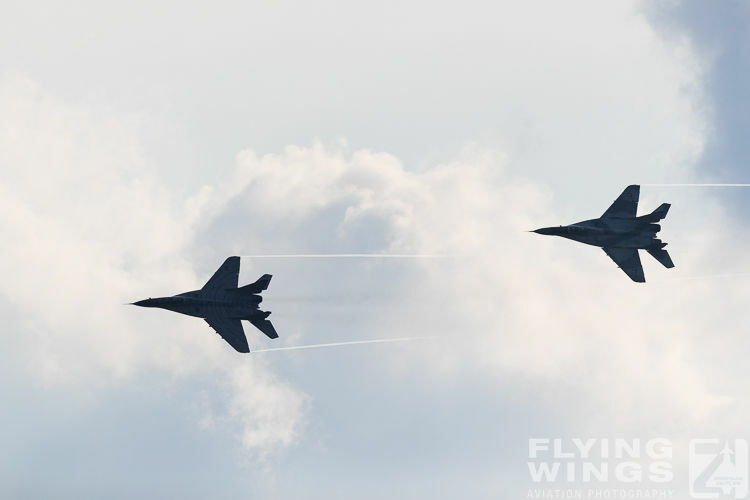 The two last-mentioned aircraft nicely showed what aircraft shapes could be observed in the sky over Sliac decades ago. 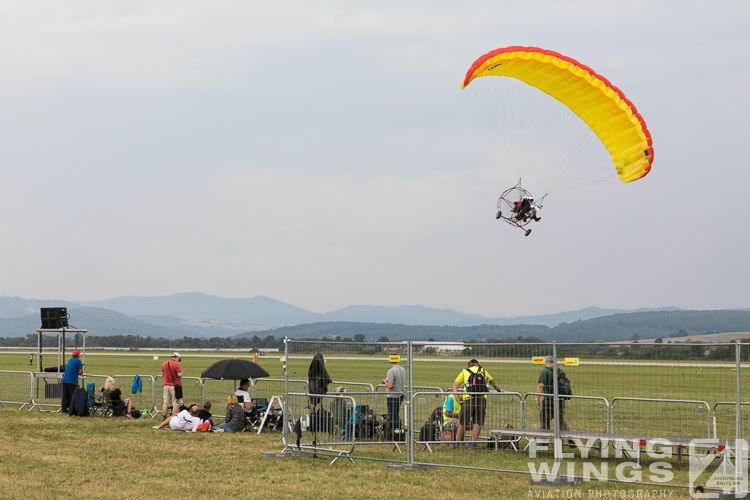 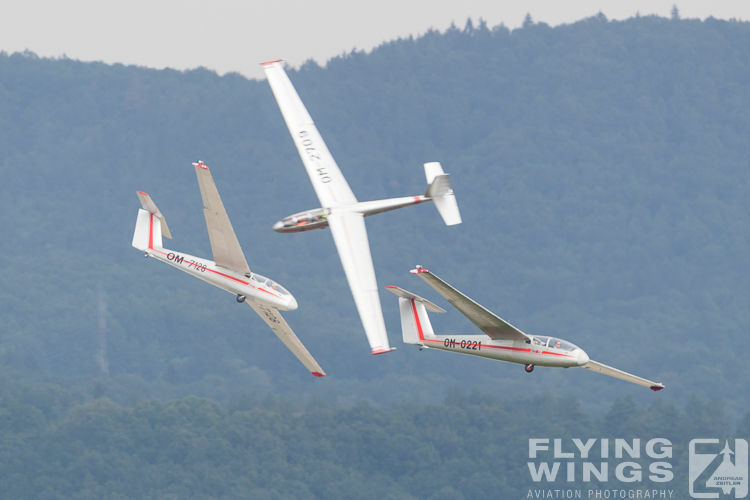 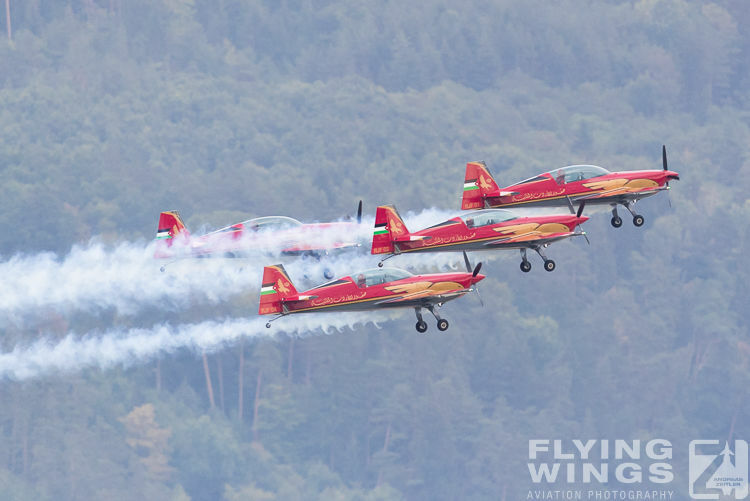 The Flying Bulls of Salzburg seem to be omni-present on the European airshow scene. 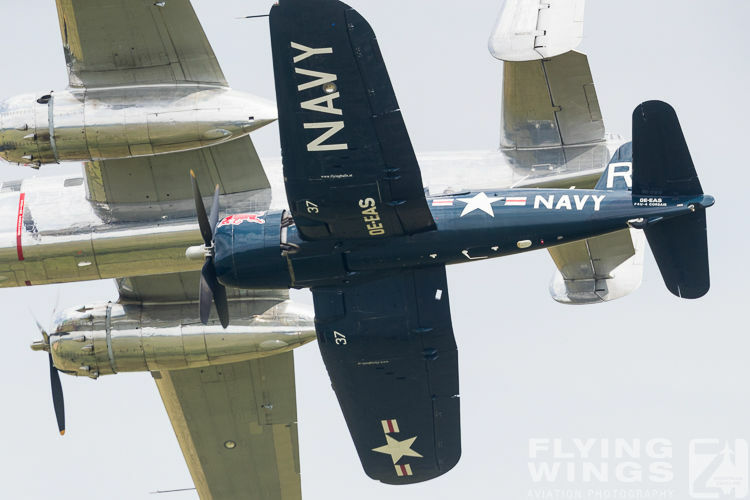 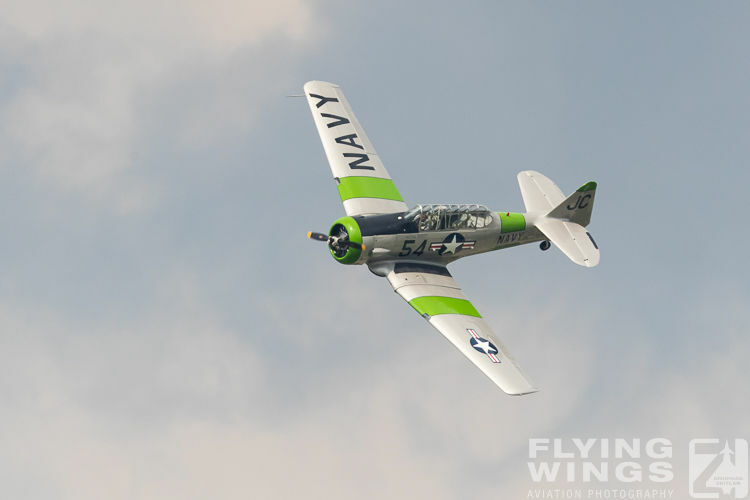 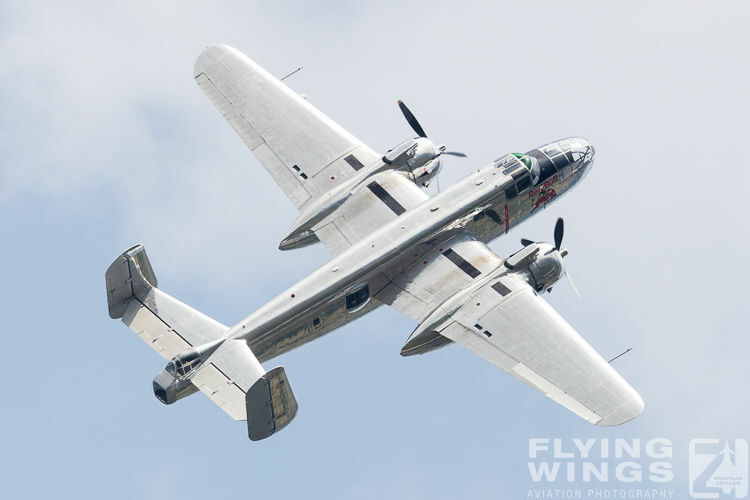 To Sliac they brought the B-25 Mitchel and F4U Corsair as well as the Bo105 ‘aerobatic’ helicopter to strengthen their image. 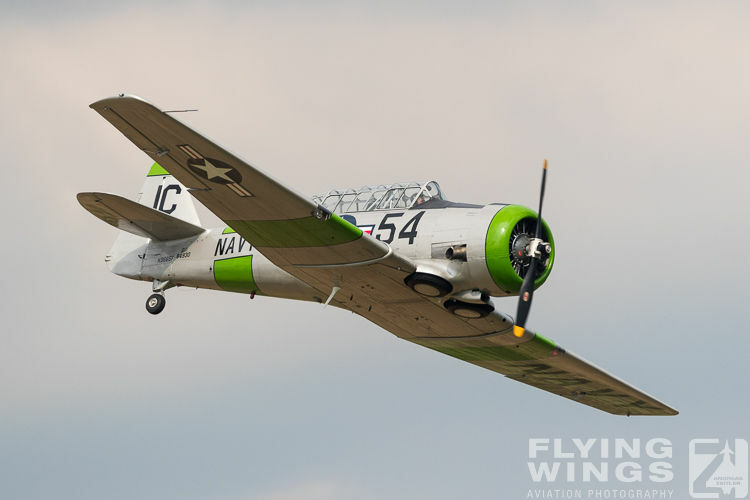 From the warbird front furthermore another T-6 Texan was part of the flying display. 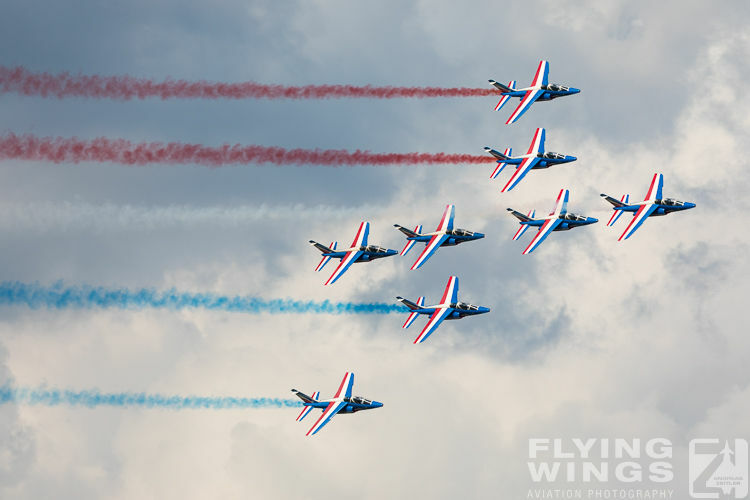 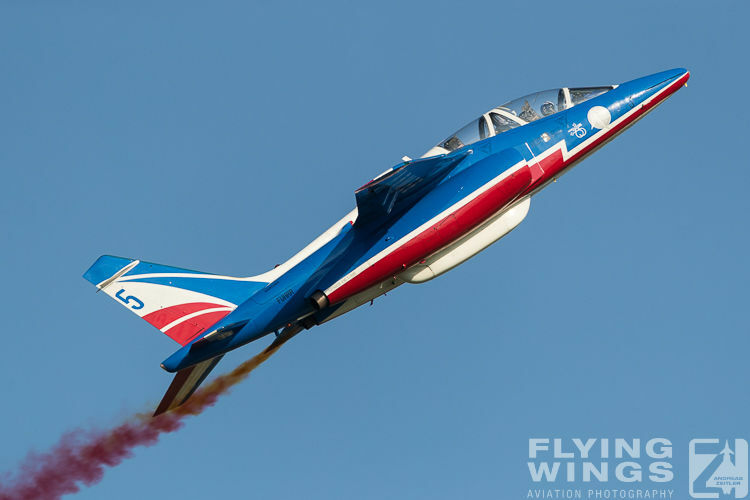 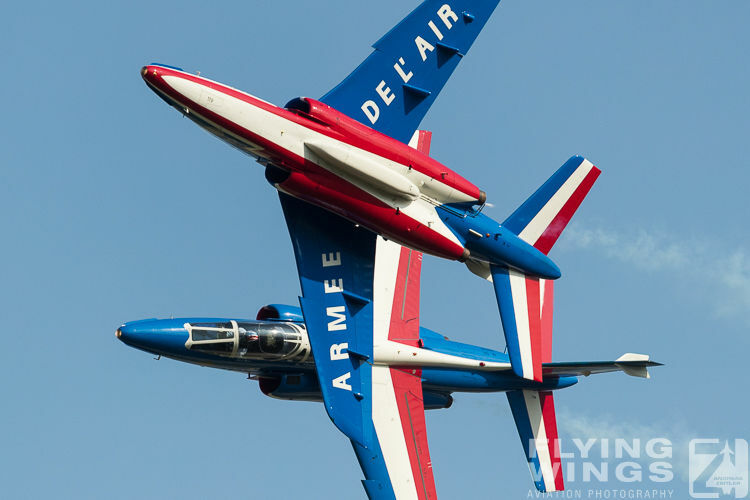 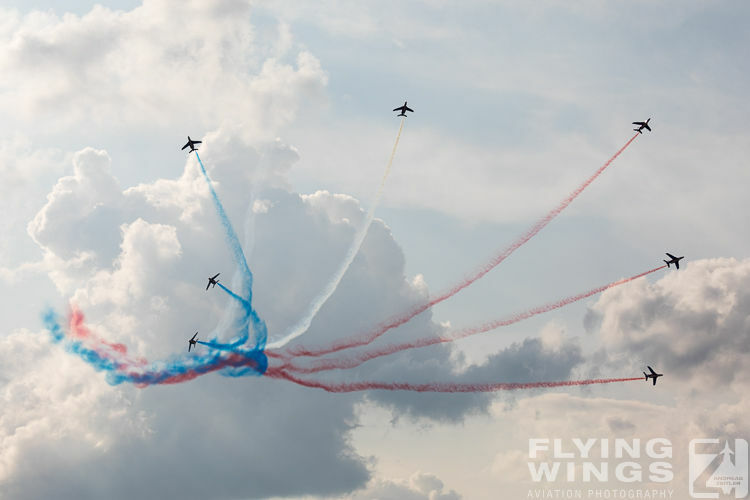 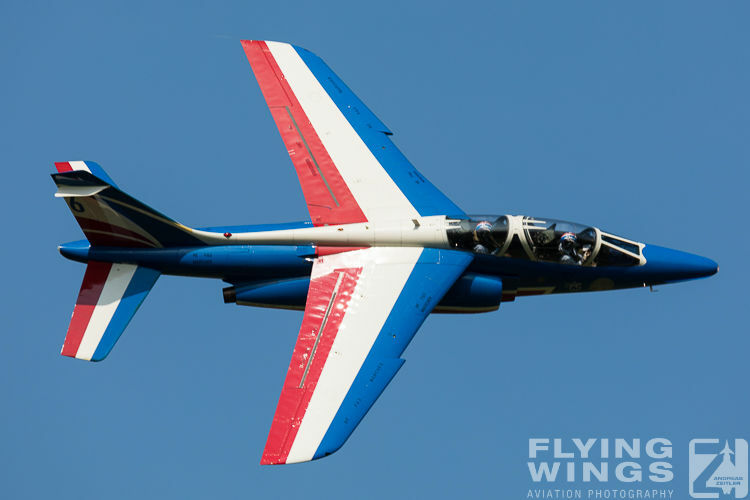 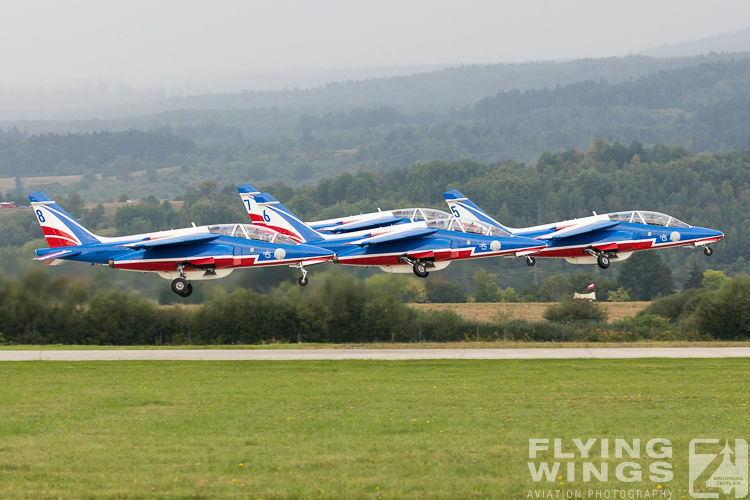 On Saturday the Armee de l’Air (French Air Force) Patrouille de France was the main act and for sure attracted most visitors to visit the show. 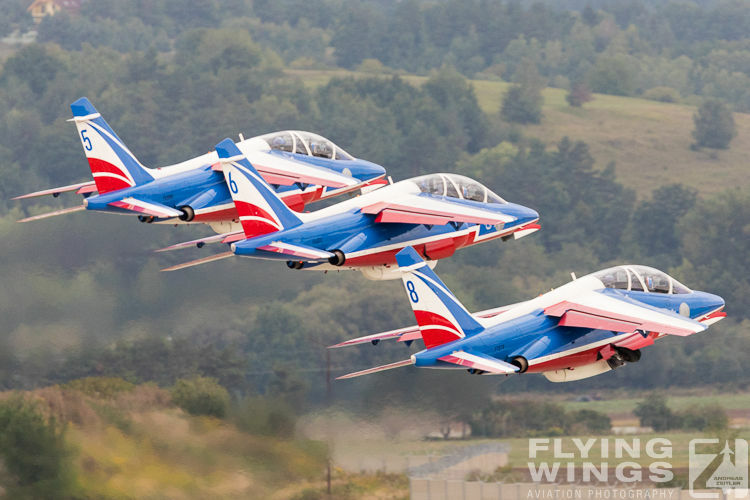 They left early on Sunday morning to continue to the next show at Cambrai and left the show to the Royal Jordanian Falcons, who did a very good show and representation of their sponsor, the Hashemite Kingdom of Jordan, flying a four ship formation of Extra 330 aerobatic aircraft. 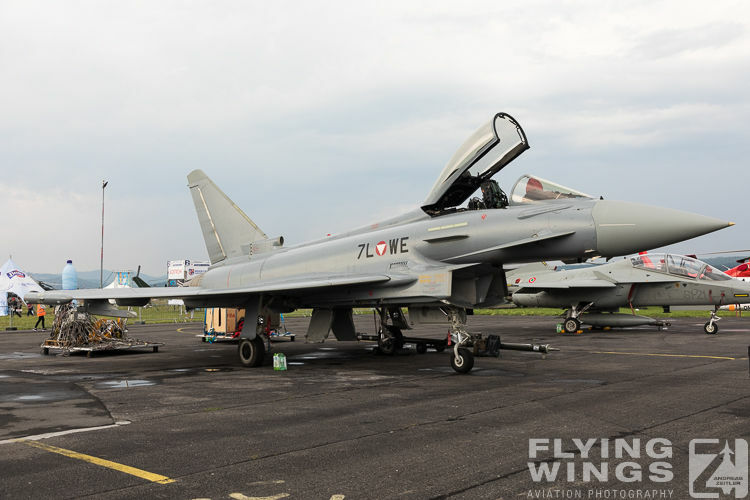 As in previous years the static display was spread out around the airfield. 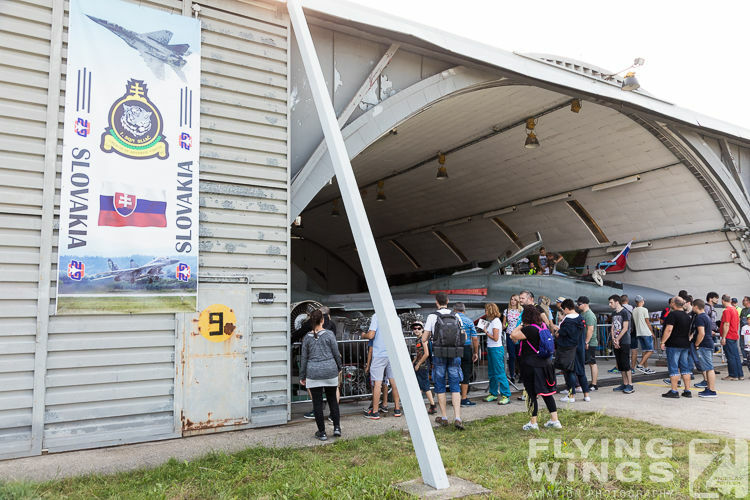 Plenty of aircraft of the Slovak Air Force were found, and some of them were available for a 'sit-in' in the cockpit. 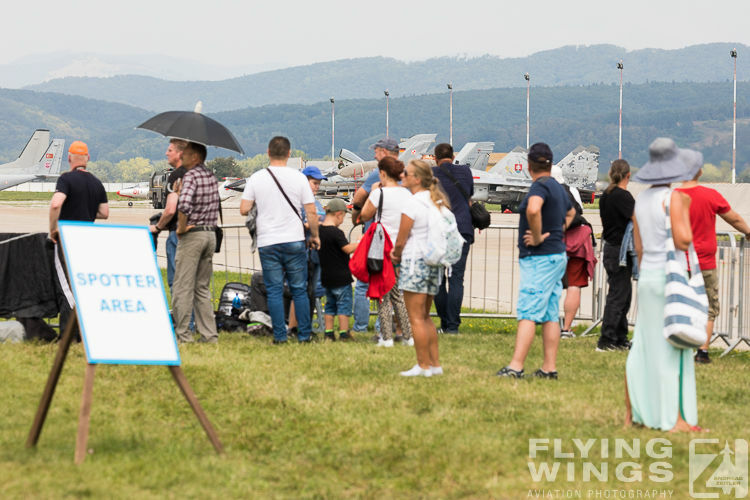 Those aircraft could easily by recognized by the long queues of people waiting for the opportunity to sit in a real jet. 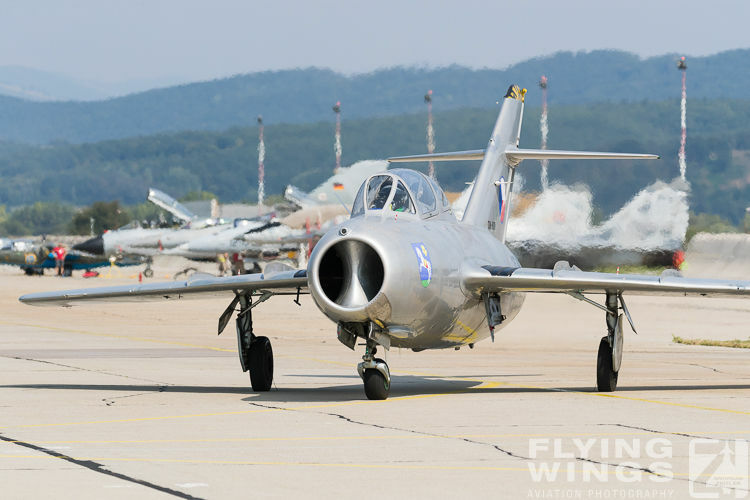 Most of the participants for the flying jets also brought a second aircraft that enriched the static display even further. 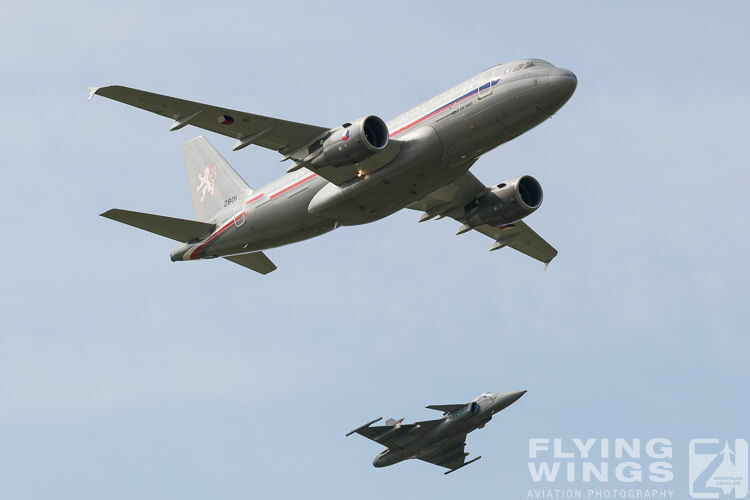 As such it was nice to see a Polish Mi-24, the Polish F-16 and two Royal Air Force Eurofighter Typhoons. 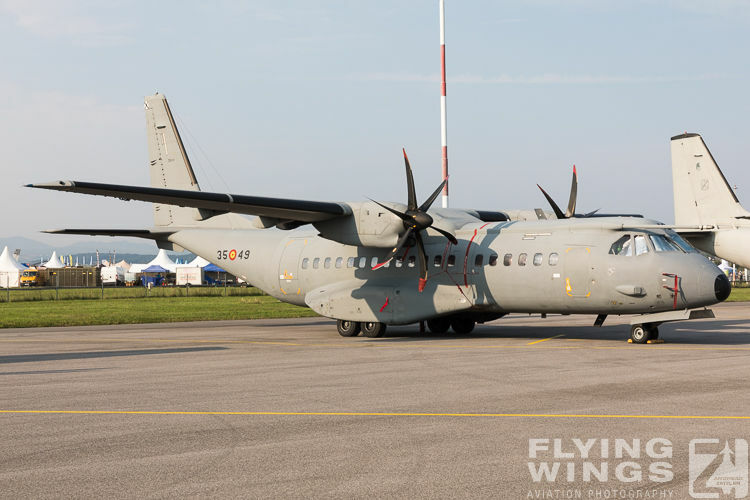 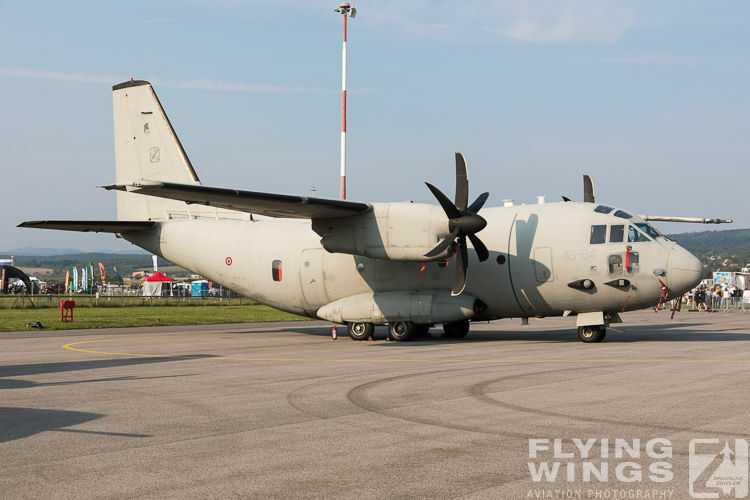 Also the Italian Air Force had a strong presence with the C-27J Spartan, the Leonardo M-346 and the Agusta HH 139 SAR helicopter. 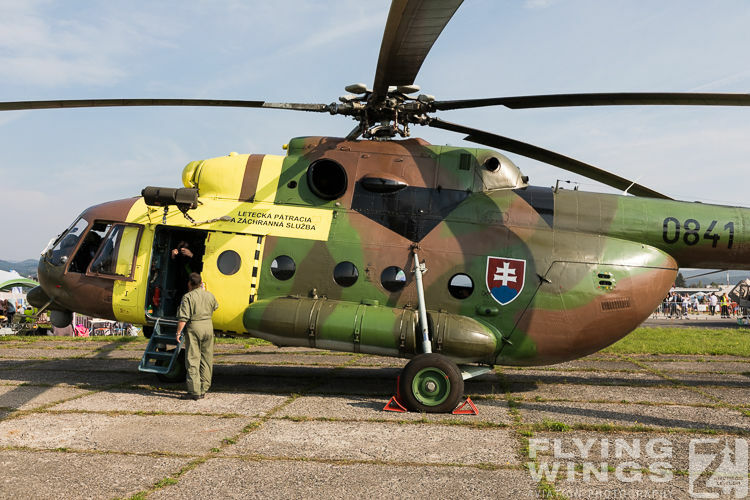 Wit the recent rejuvenation this might be a sign that these aircraft are also being pushed to become part of a future Slovak Air Force. 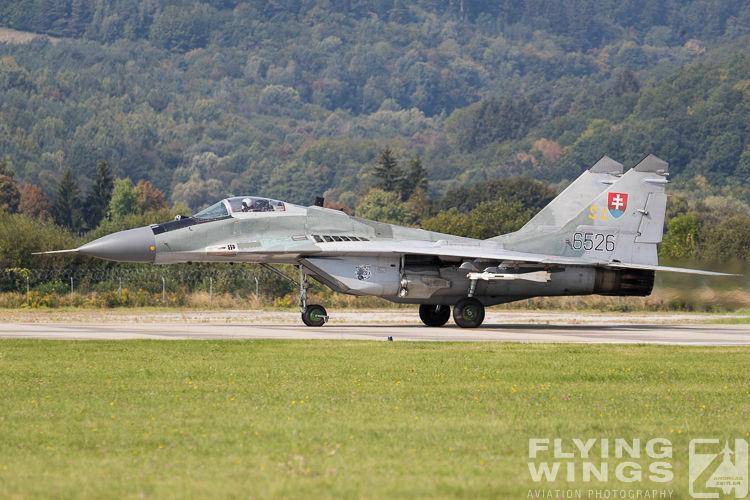 Last but not least in a surprising announcement the Turkish Air Force also came for another visit to Sliac. 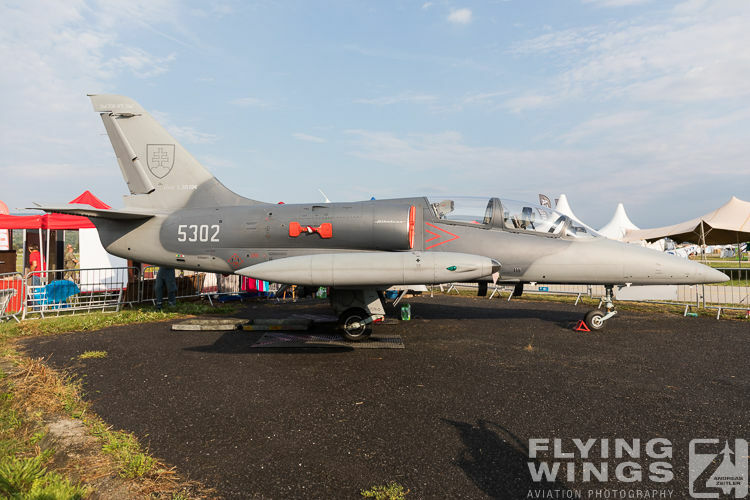 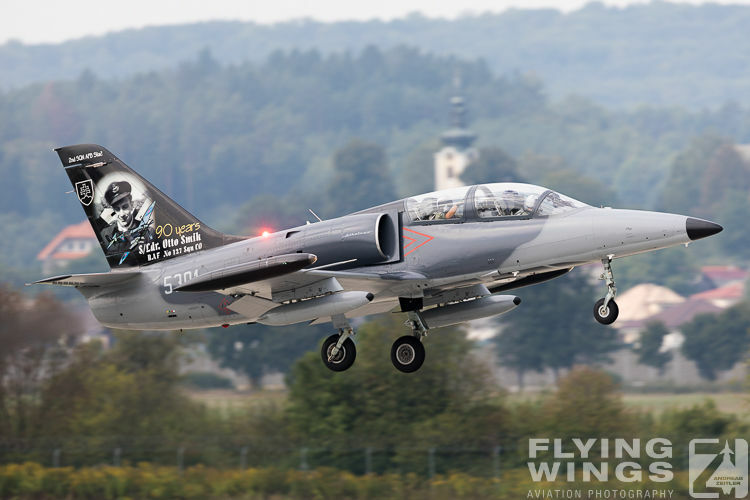 Once again two F-4E 2020 "Terminator" Phantoms were sent to Slovakia. 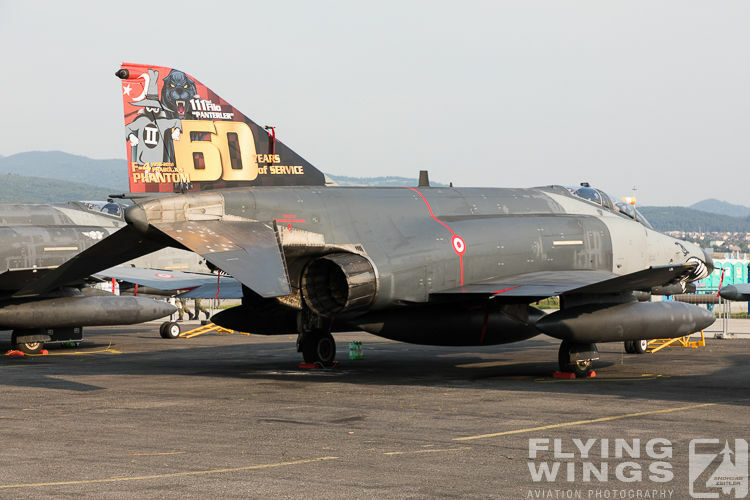 One of the jets of 111 Filo "Panthers" even wore a special tail art to mark 60 years of the Phantom II. 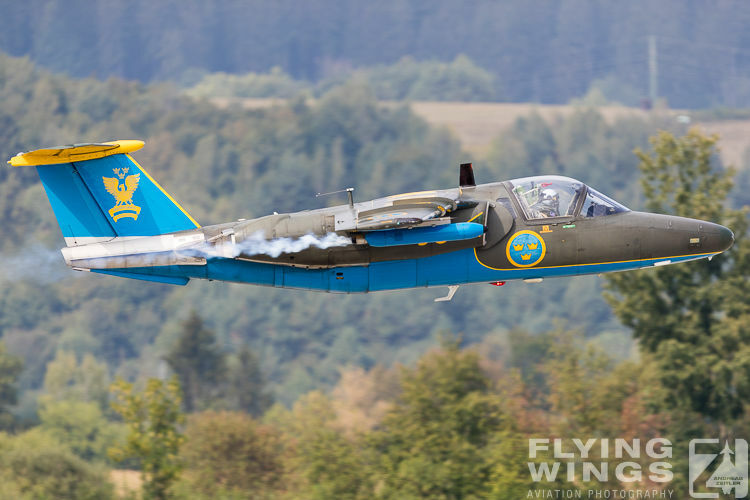 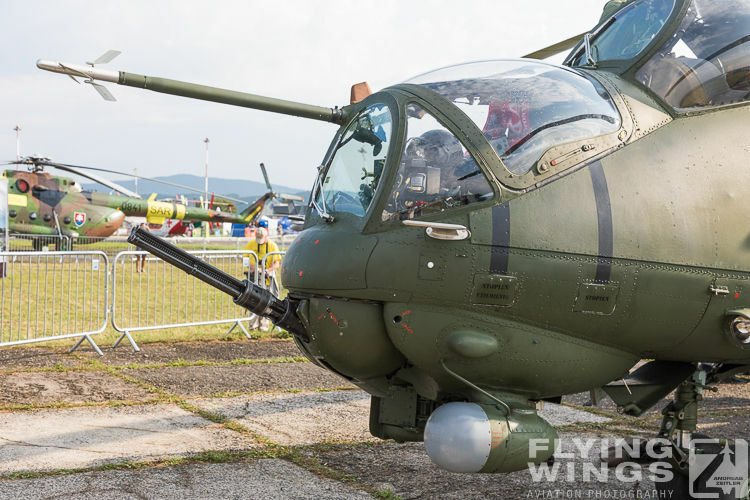 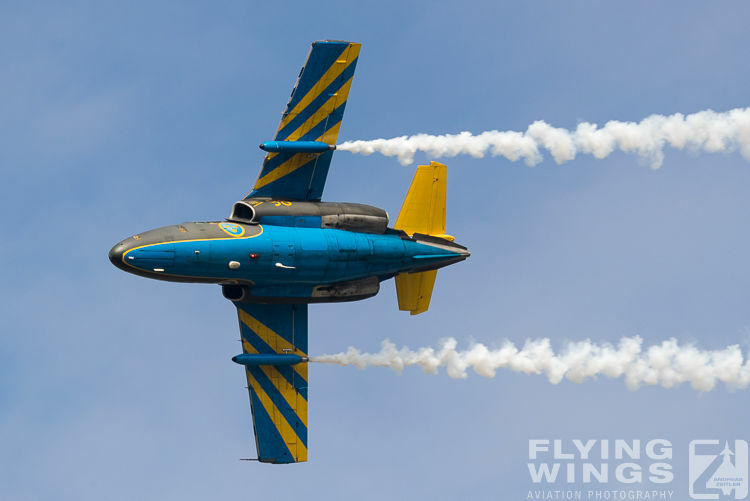 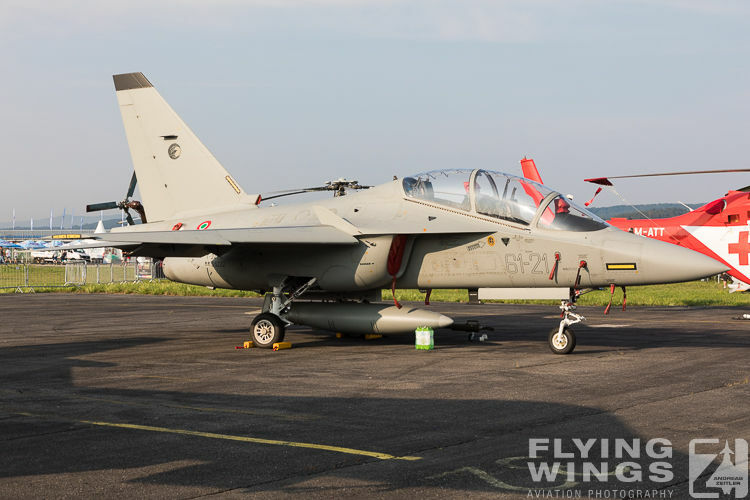 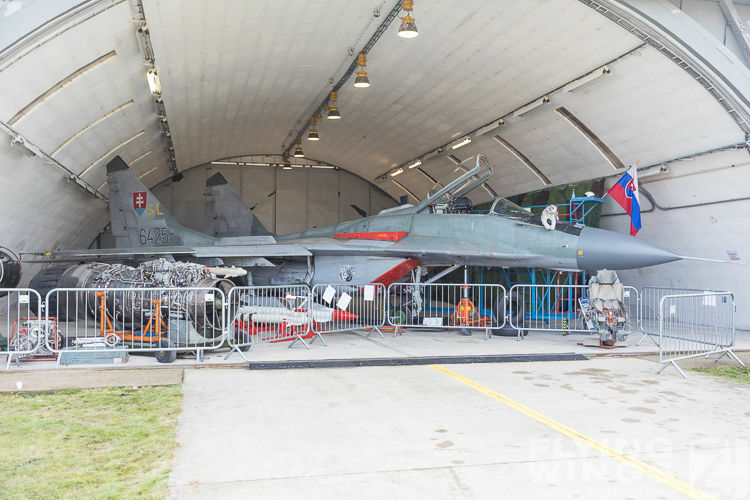 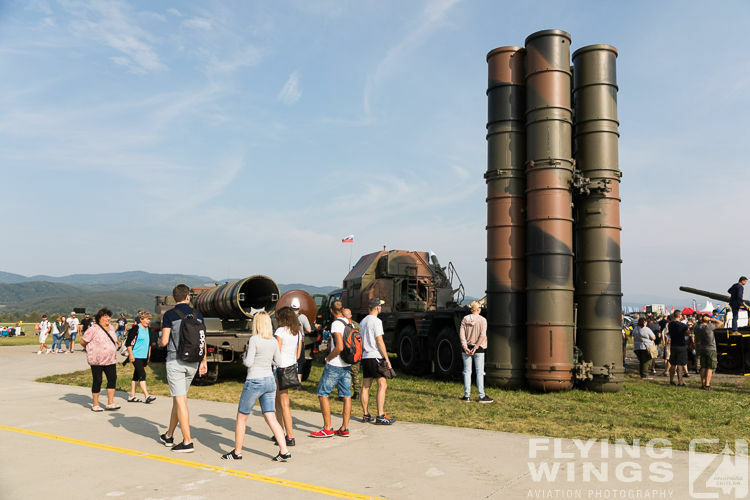 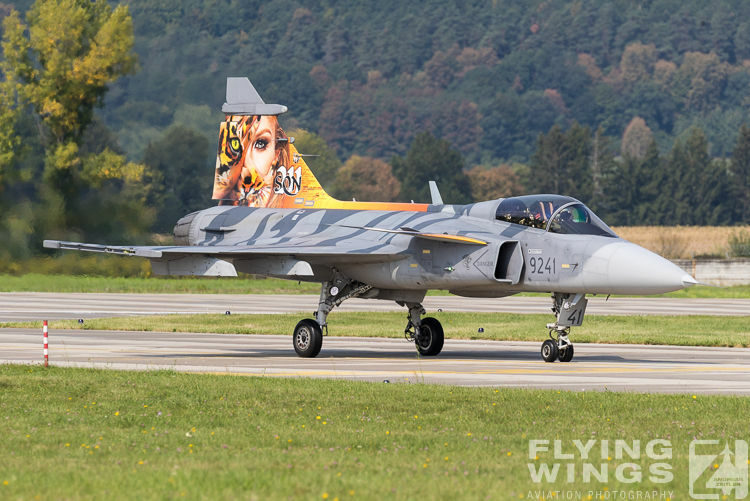 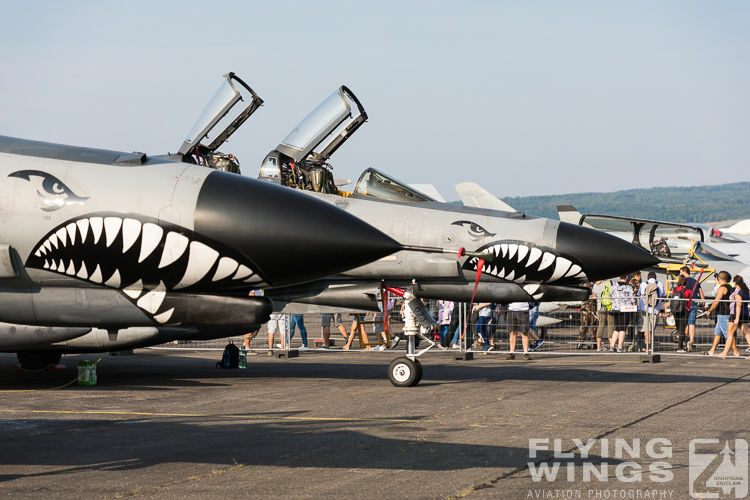 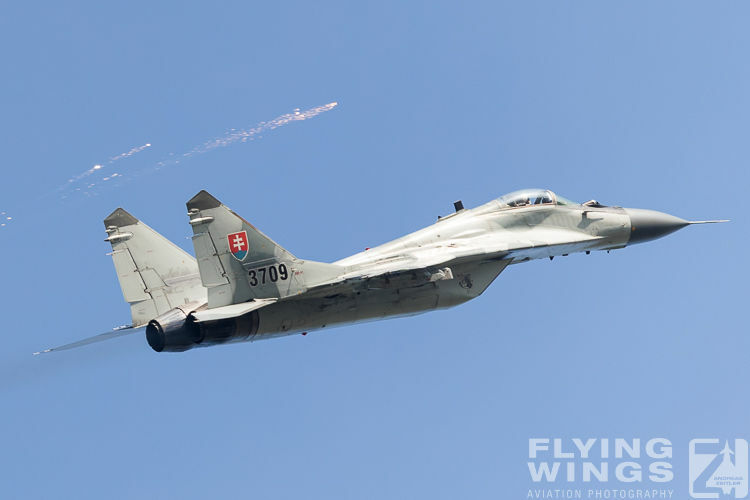 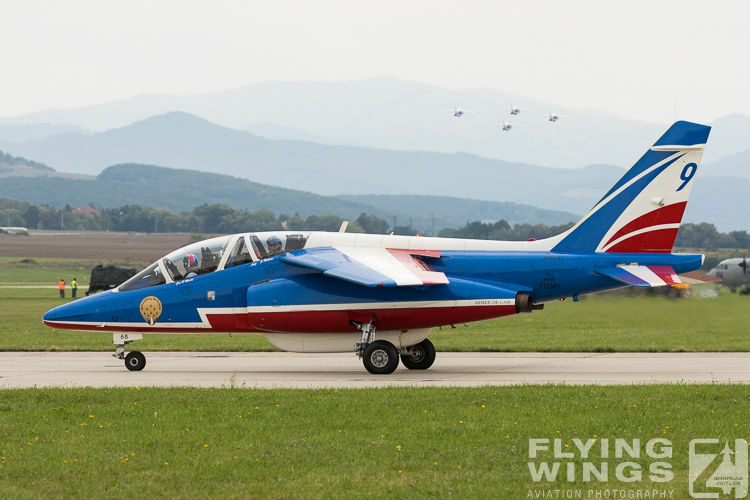 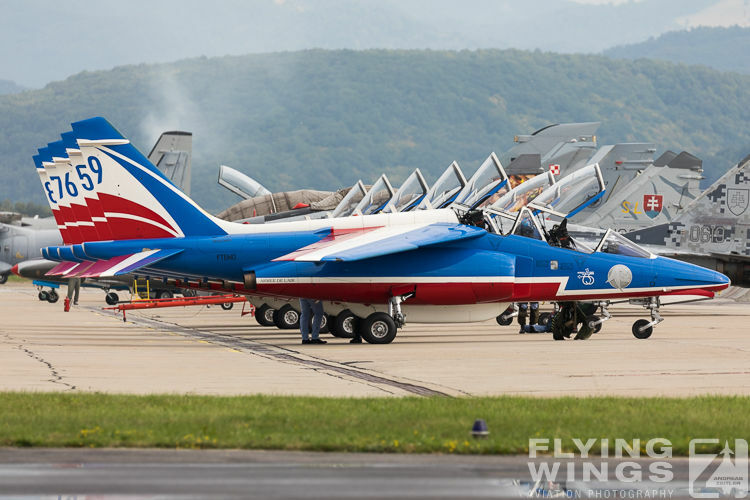 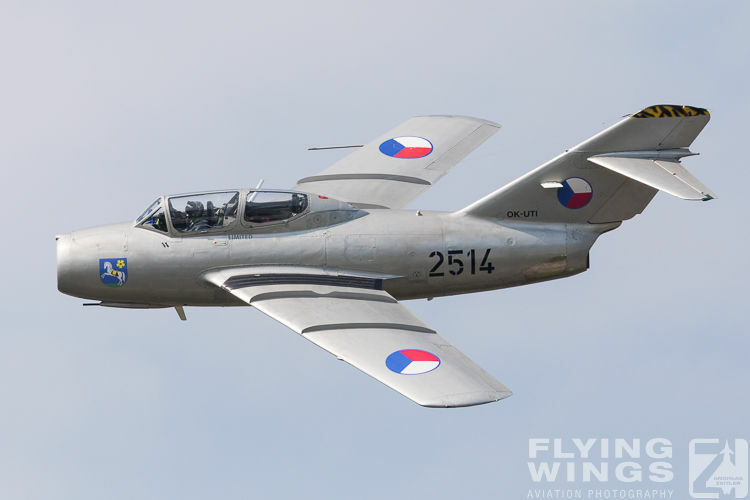 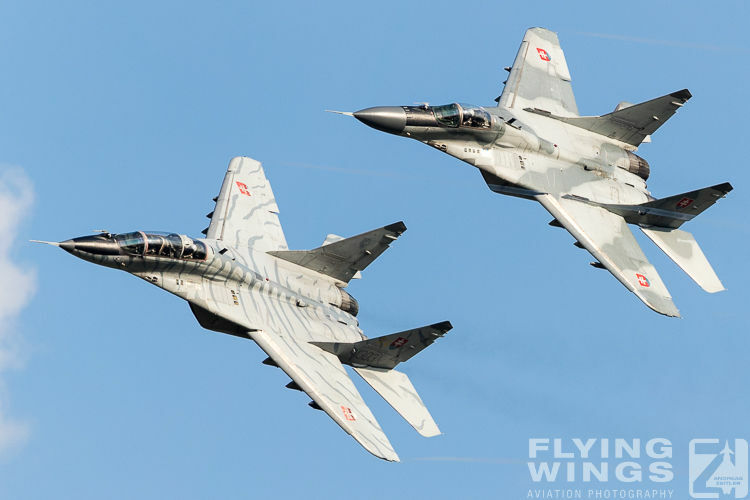 Concluding this report the Slovak International Air Fest SIAF airshow was another very fine event, that is still spreading an Eastern European charm. 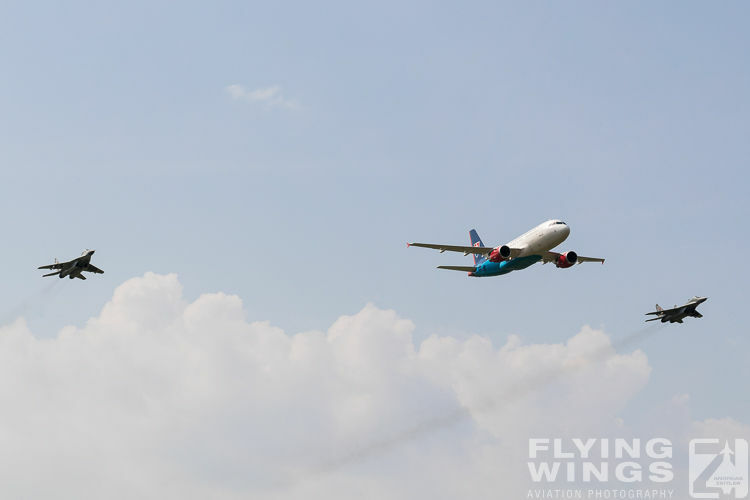 The flying is really good and prices are reasonable. 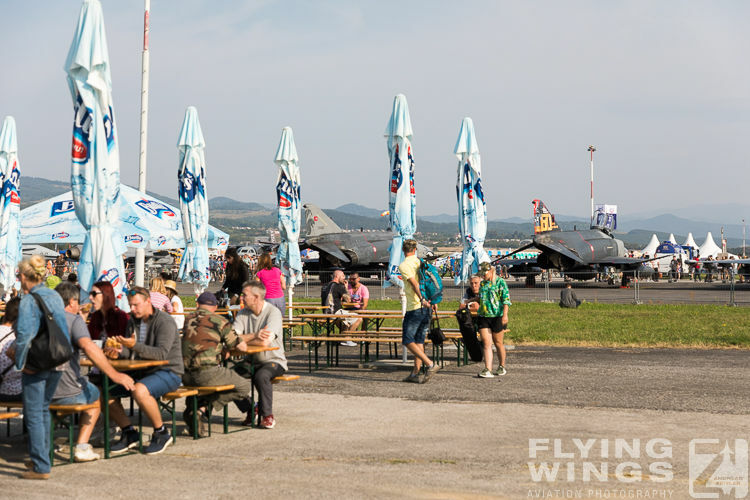 For a ticket fee of 13€ a full day of entertainment is guaranteed. 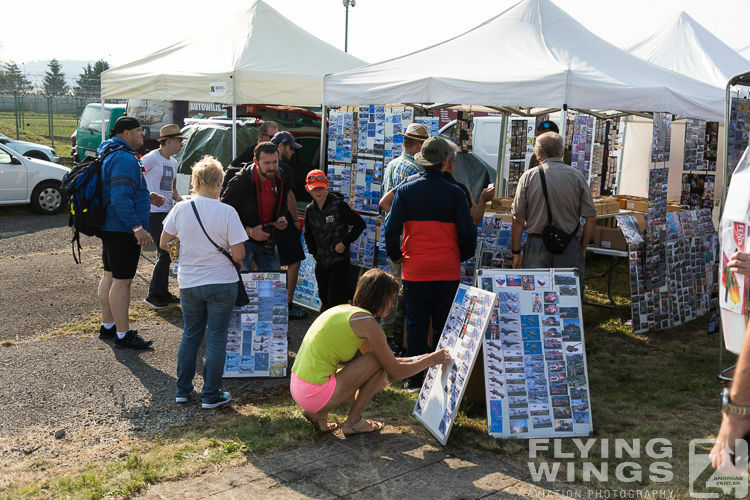 Serious ‘spotters’ should consider the spotter ticket, which also offered a really good value at 15€/day including some reserved areas for photography on the airfield and some goodies and souvenirs of the airshow. 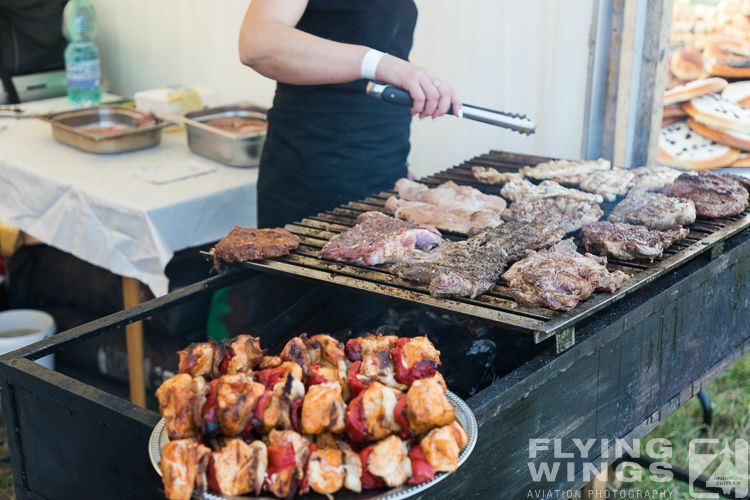 Of course you will not also not stay thirsty at such an event as beverages cost 1,50€ (Kofola or beer, up to you to decide…) and there is plenty of food. 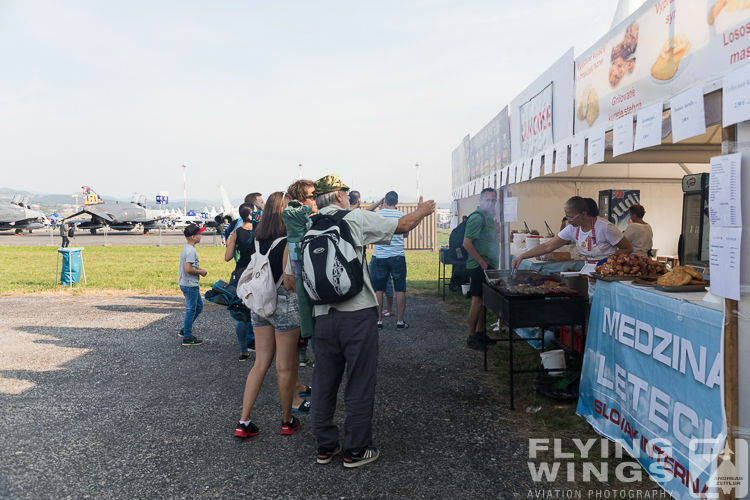 Only the price for a Klobasa sausage was a bit high and pyramid cake was sorely missed. 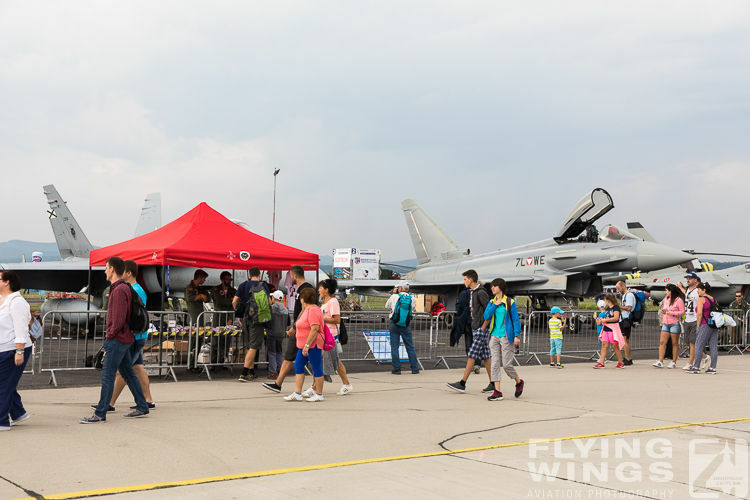 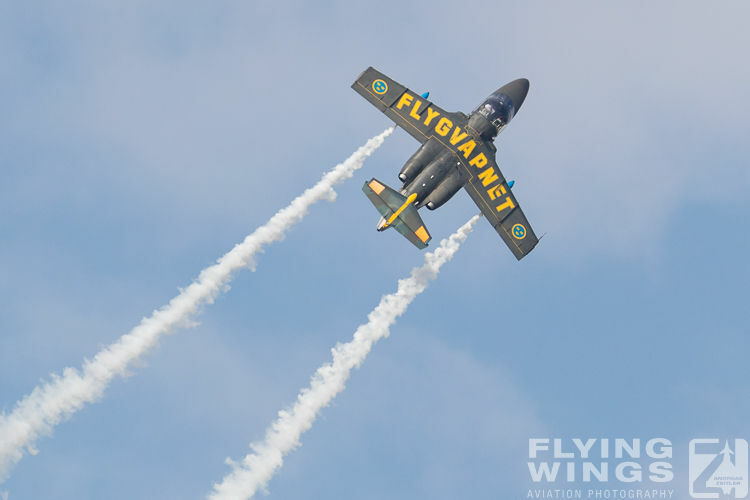 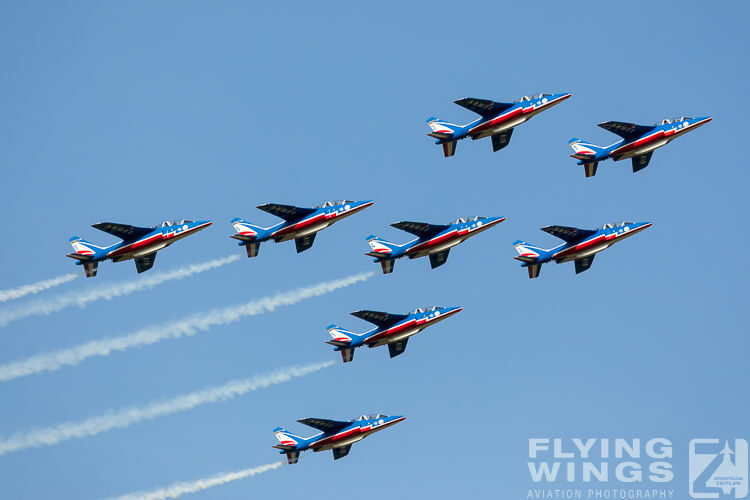 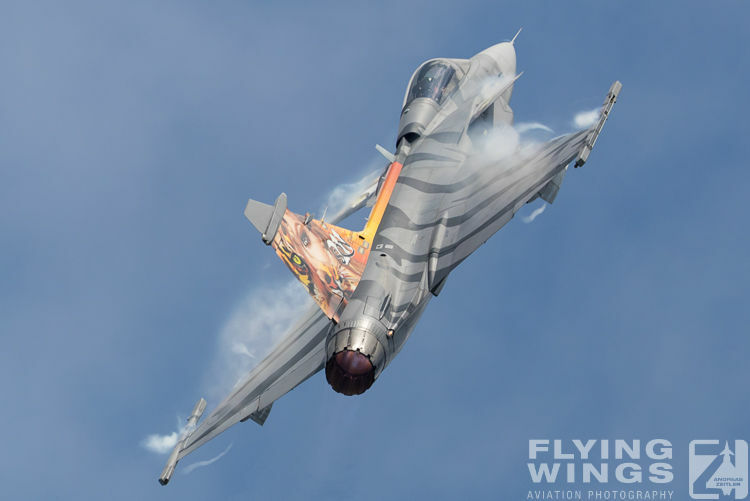 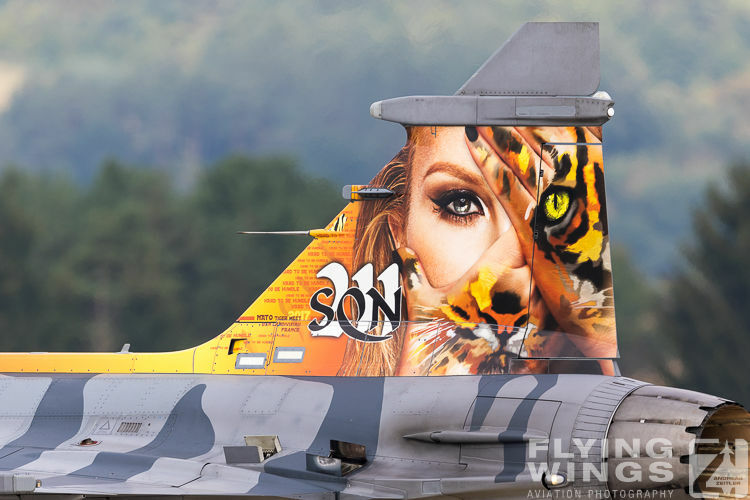 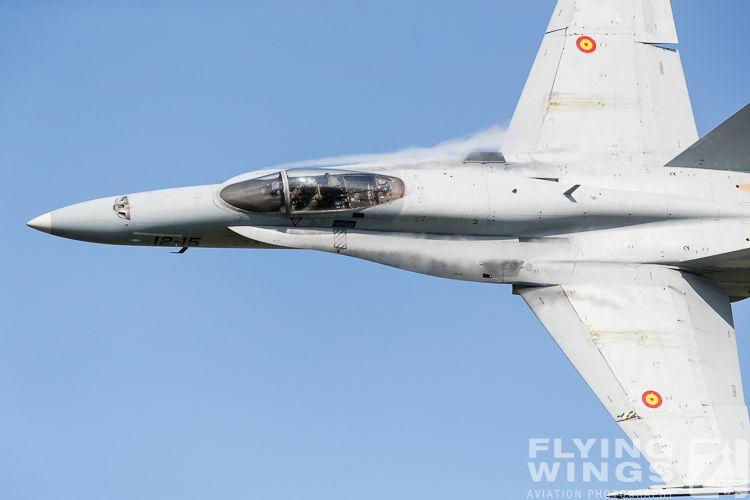 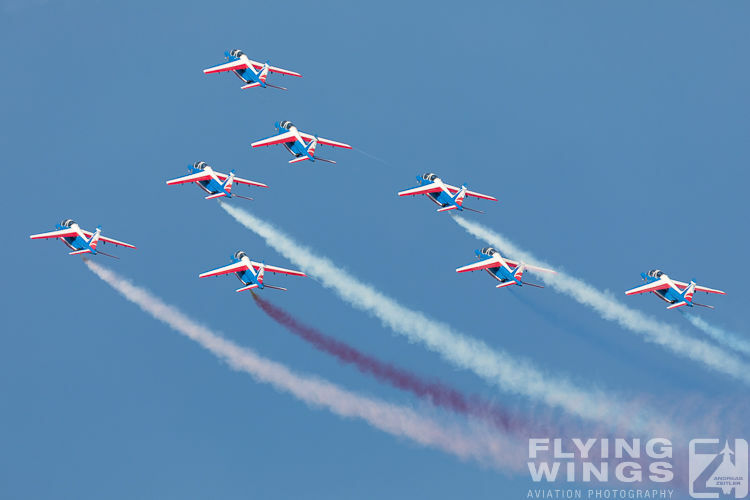 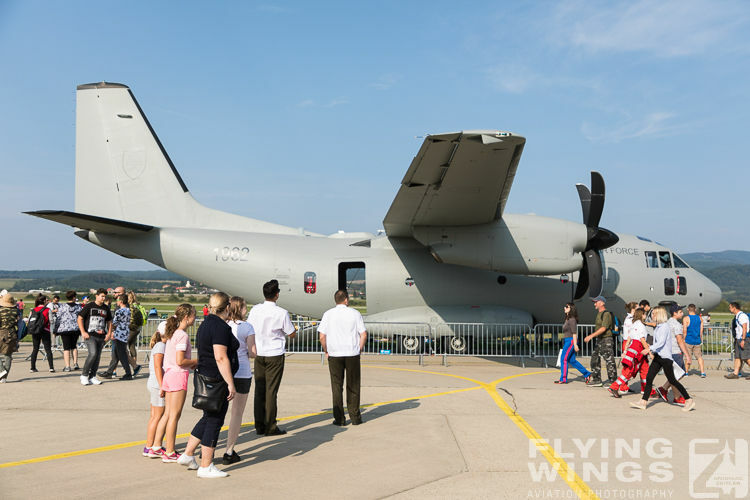 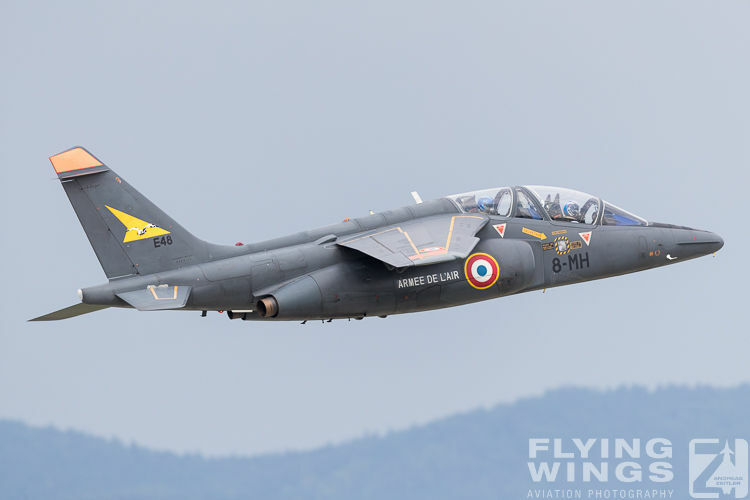 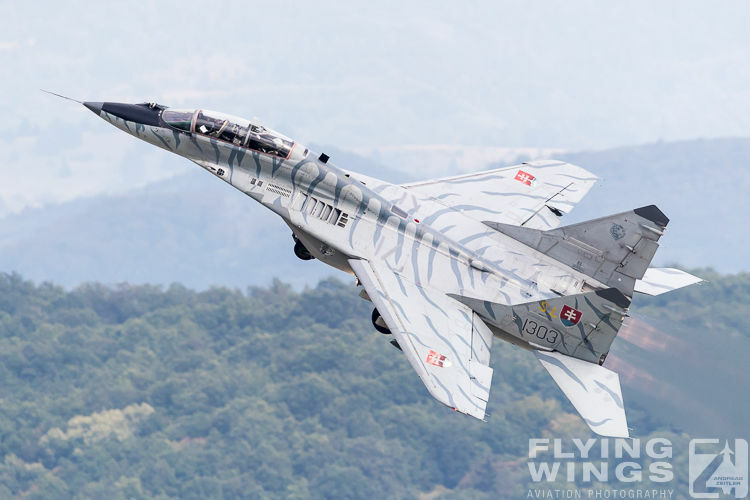 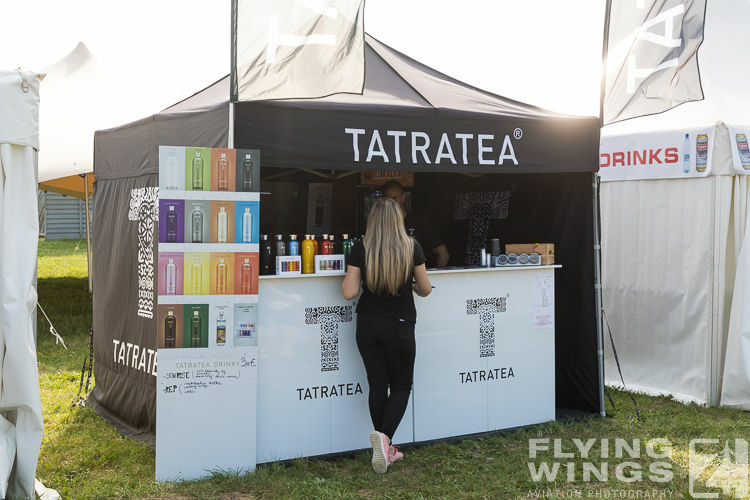 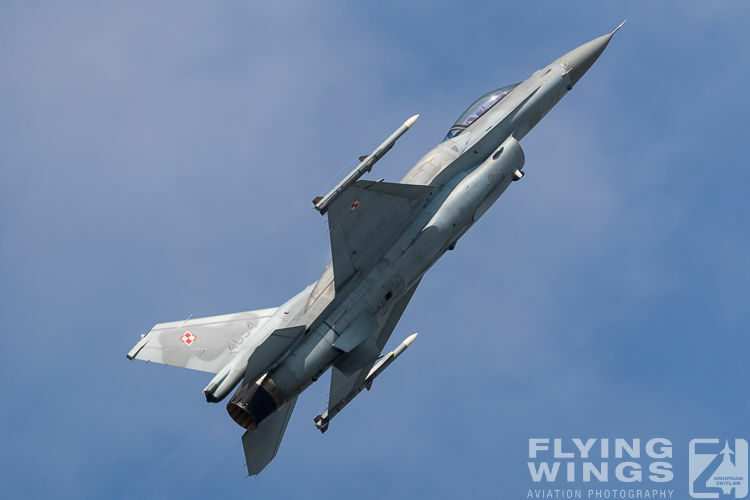 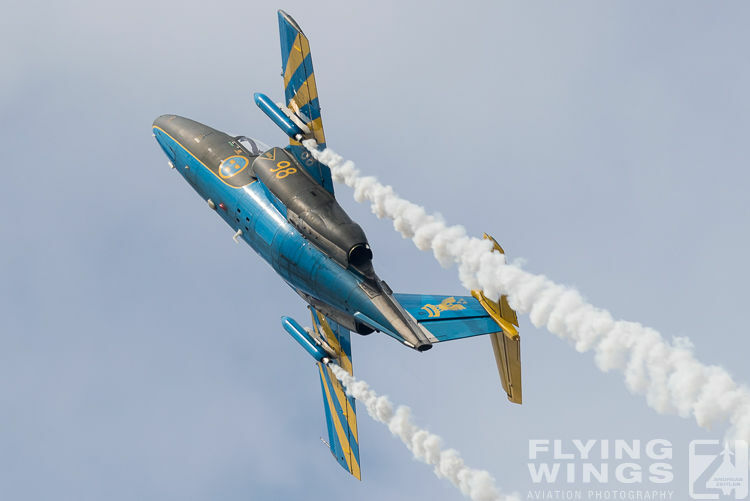 The SIAF airshow is traditionally held on the last week-end of the Slovak school summer holidays, however the next edition in 2019 is scheduled on week earlier, which means August, 24th-25th 2019. 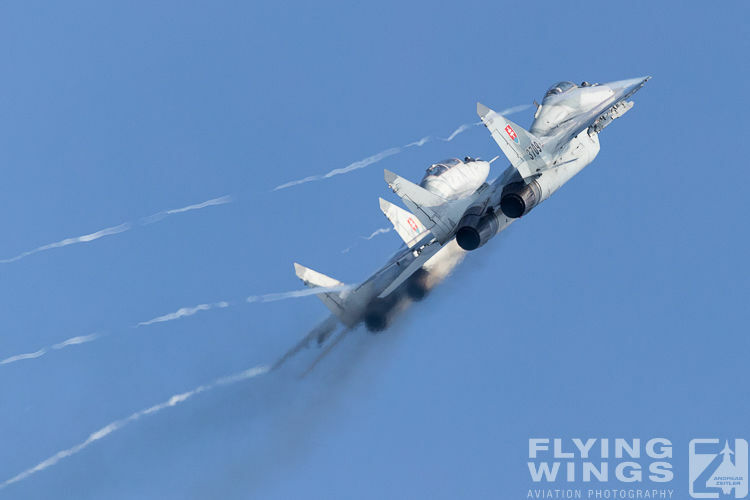 For sure the MiG-29s will then also trail their black smoke over the airshow ground!